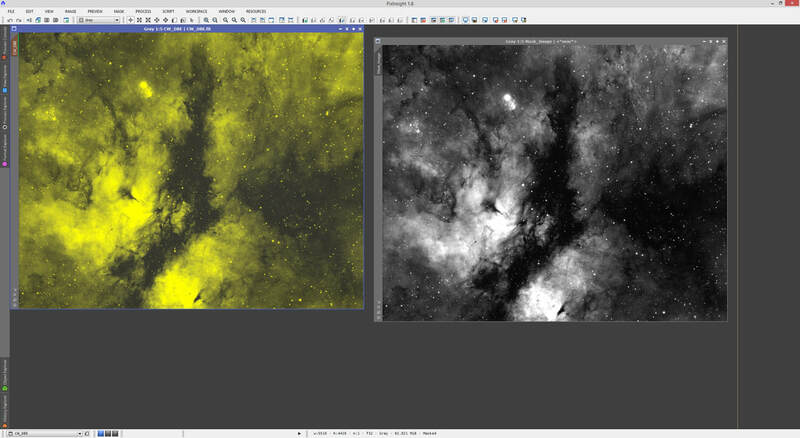 PixInsight is arguably the de facto standard in high-end astrophotography pre- and post-processing software (applicable to deep space). There are various features of it that easily prove its exemplary performance, though some people appear to be easily put off from its interface (most probably through its different nature compared to more familiar software such as Adobe Photoshop). Others complain about its price, but it is a realistic assessment that PixInsight can replace all other pre- and post-processing software in one piece, costing less total than Adobe Photoshop alone and Adobe Photoshop strictly by itself cannot perform everything you may need to perform. PixInsight offers a 45-day trial for anyone who is interested. This tutorial serves to bridge the gap that naturally exists when you first encounter the PixInsight interface. It is down-to-the-point and may also offer some insights to some of the more experienced users. 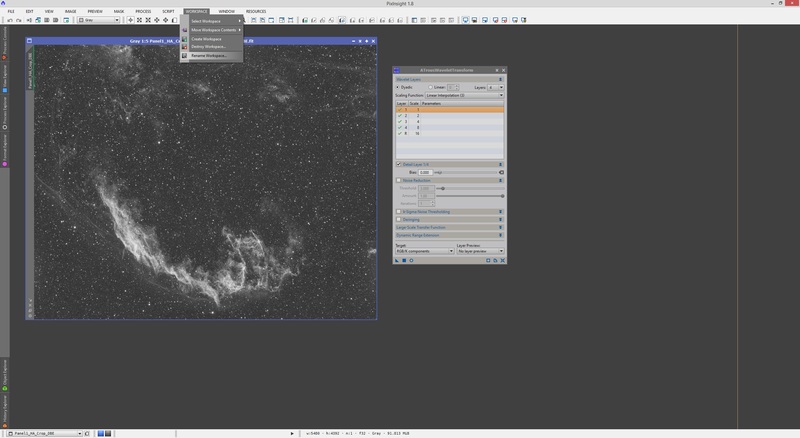 I consider this tutorial essential reading if you are new or relatively new to PixInsight, and in particular if you are to follow my other tutorials. My other tutorials will assume much of the knowledge gained through this tutorial. Along the bottom, we find shortcuts to various workspaces, which are essentially like desktops. These allow you to work on different things within one project without having everything in the way. More on workspaces later in this tutorial. Clicking these buttons essentially switches you between the various workspaces. Along the left, we find various mouse-over pop-up buttons lined up from top to bottom. The first one is Process Console. 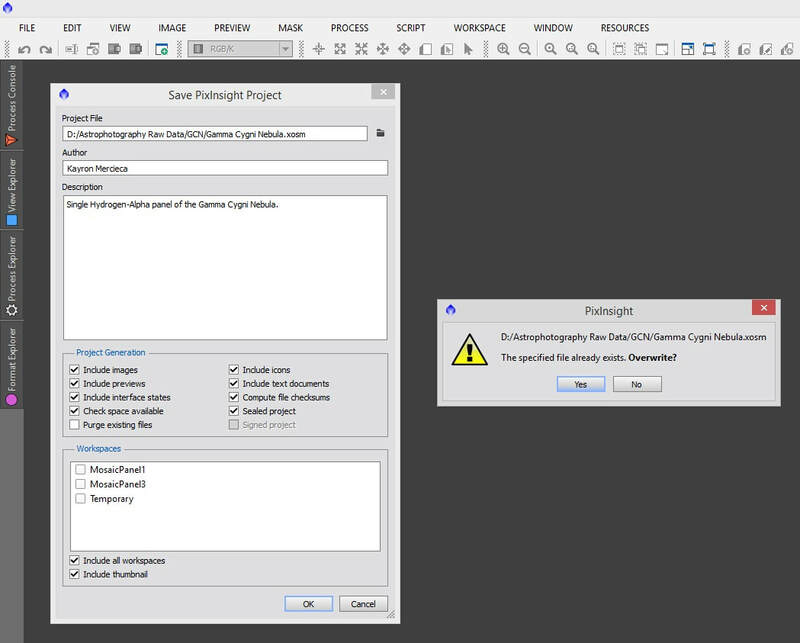 This pop-up window is essentially a history of operations that are carried out by PixInsight. When PixInsight starts or a process runs on an image, this pop-up window automatically displays progress and status information. It can be important for certain aspects of your processing of images. Clicking outside of this pop-up window will automatically close it. You may click the Stick button on its top-right corner if you wish to keep it open. This can still be hidden at will by clicking the Hide button to the right of the Stick button. Having Stick active however, will keep this pop-up window open whenever it is opened (automatically or otherwise), until you click Hide. 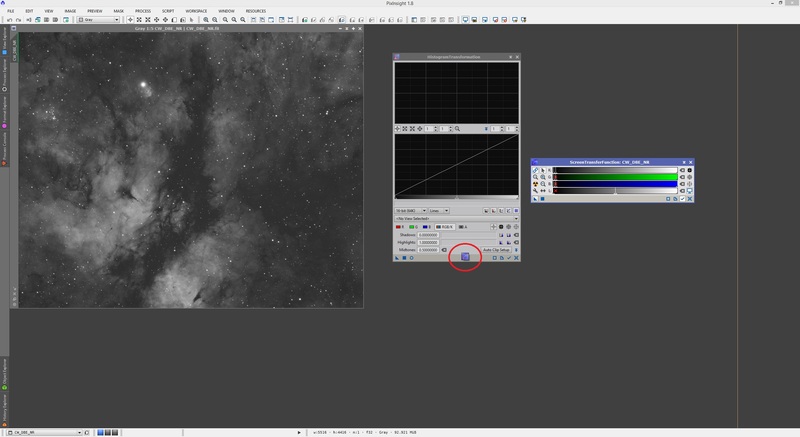 You will find these Stick and Hide buttons on all the pop-up windows in PixInsight and can be operated in the same way. 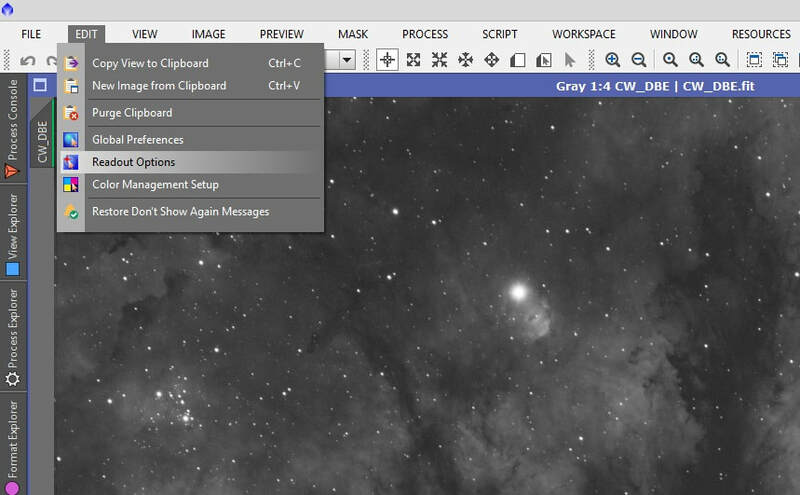 The second one on the left of PixInsight is View Explorer. Listed here are all the images you have open in PixInsight. Clicking them displays information about each image and double-clicking them will open the workspace that contains the image itself. The third one worth going over at this point is the one at the very bottom - History Explorer. 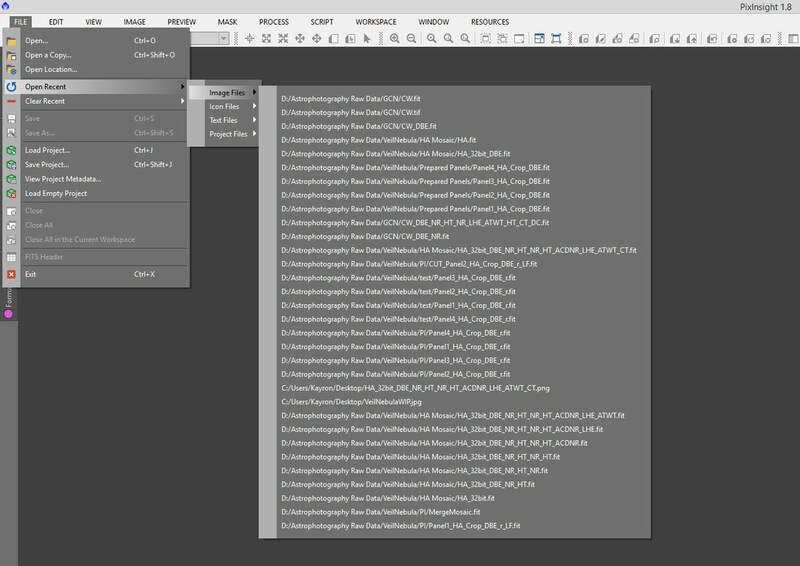 After you have applied some of PixInsight's processes to images, the History Explorer keeps a log of what has been applied and in what order. If you double-click on any of the processes listed, the process will open up in the state it was applied. This can be very useful if you wish to re-apply the same settings without having to redo them. More on processes later in this tutorial. 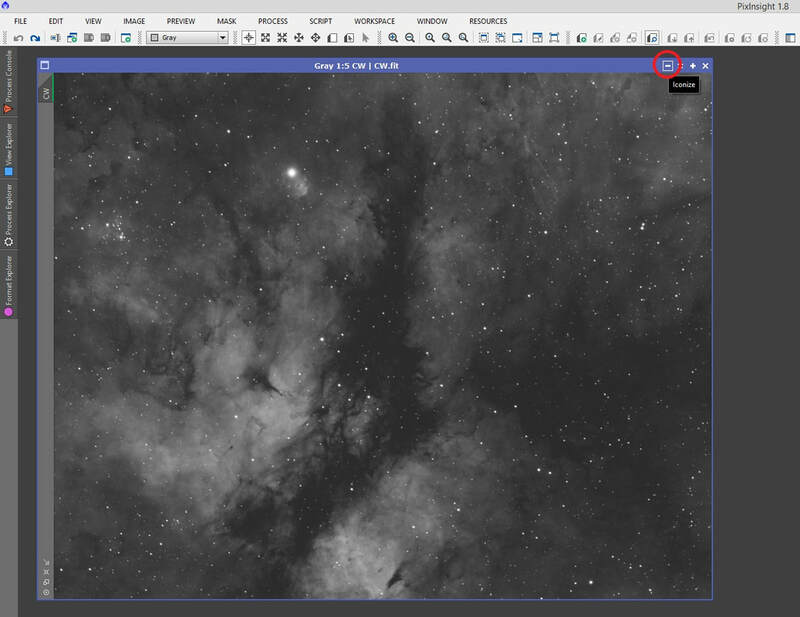 Along the top of PixInsight, we find the common things we find in all programs - toolbars with lots of shortcuts. First and foremost, these can be customised easily, just like in most programs. This is done through the View -> Tool Bars menu at the top. Checked as enabled are the ones currently in your toolbars. You may click to disable any of these and the relevant toolbar will be removed. You can also click any that are currently disabled in order to add the toolbar. 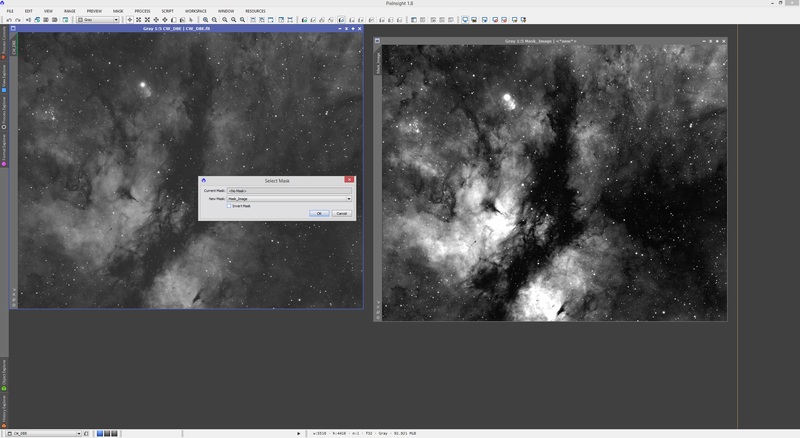 Toolbars can be moved around and resized once they are placed within your PixInsight interface. This can be done by holding the left mouse button over the separator column and dragging it left or right. 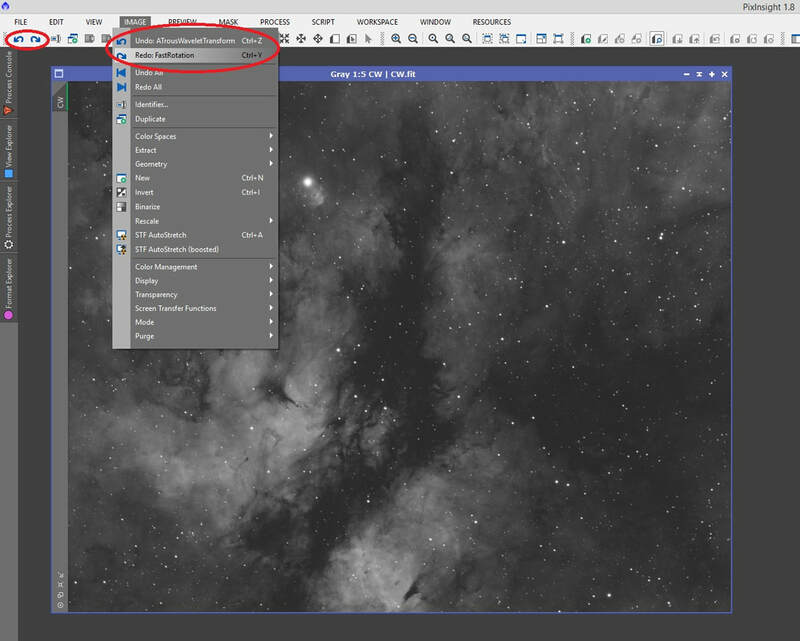 If you wish to re-arrange the toolbars to place one before another, you can actually drag the separator column for the toolbar you wish to move outside of the toolbar area and drag it somewhere else along the toolbar area. This will make space for it and you can then drop it in place. 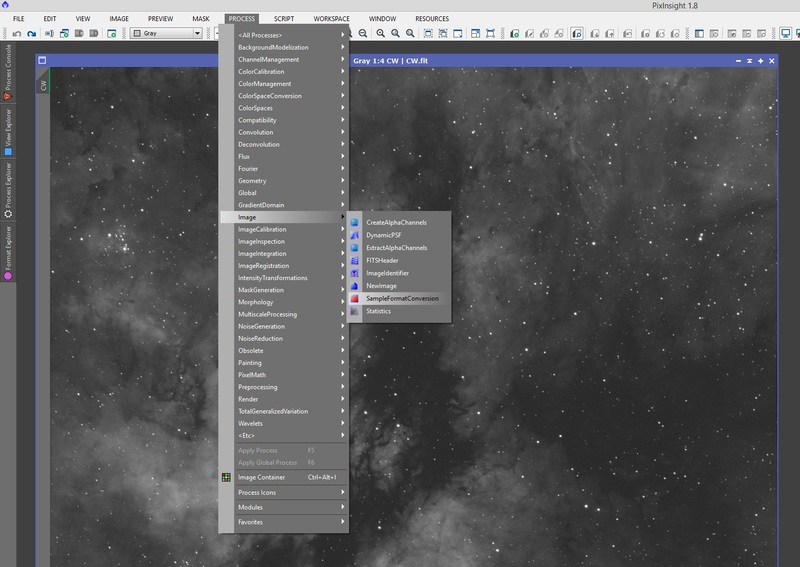 The toolbar area can also be extended. The thin line that appears directly above the floating toolbar on the first screenshot above signifies that the user can actually drop the toolbar into this area to make a second toolbar area below the default one. 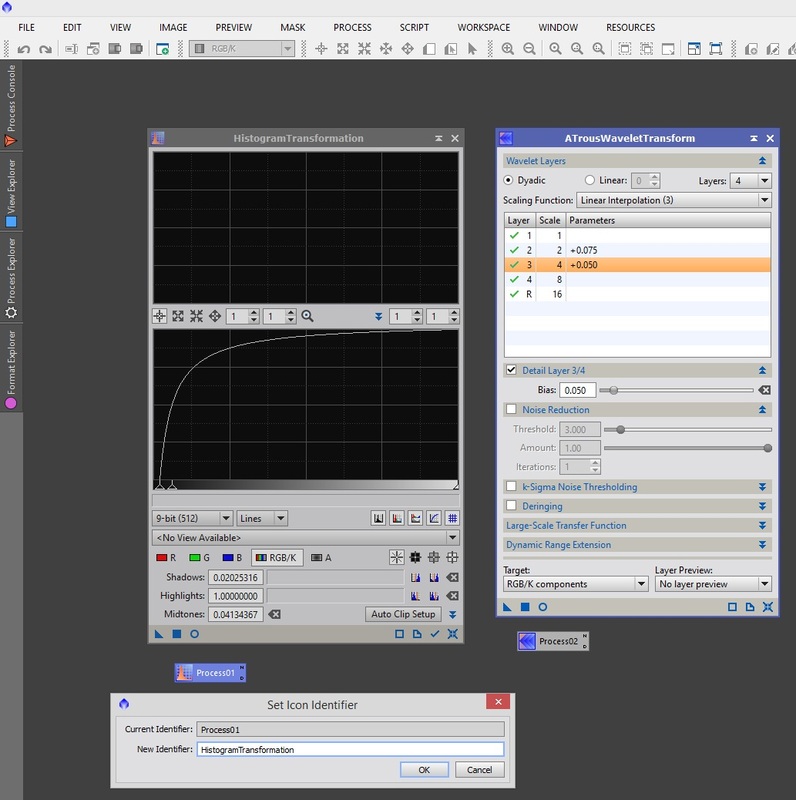 Customising the toolbars can certainly optimise your pre- and post-processing workflows. Experience with the various toolbars is key to realising which ones work best for you. I personally find the default set to work well for me. Later in this tutorial, we will look over some of the more useful toolbar shortcuts that are there by default. 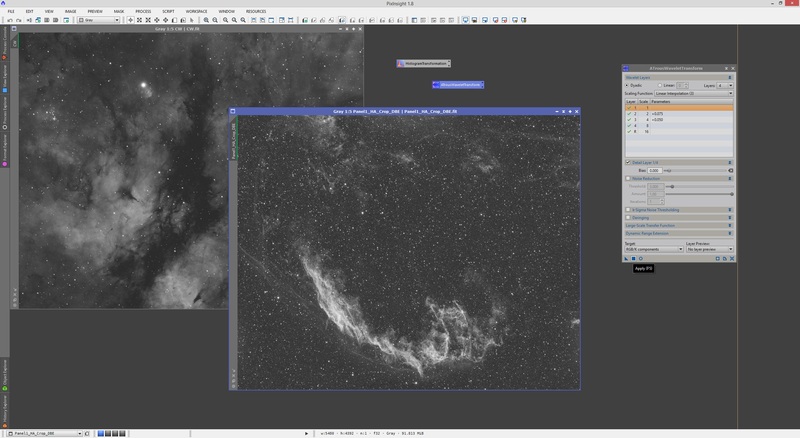 ​Though it appears as if we are reaching a point at which PixInsight appears complete, it is prone to updates to its various processes and scripts, as well as the main program itself. Updates to the main program itself are manually installed. E-mails are received notifying of a new version of PixInsight, which requires you uninstall your current version and then download and install the new version. However, every so often, processes and scripts are updated in PixInsight and this does not require you reinstall PixInsight from scratch. Instead, when you start PixInsight, it will check for updates automatically and notify you if there are any. You may also check manually by going to the Resources -> Updates -> Check for Updates menu. Updates that are picked up can be downloaded and installed automatically. PixInsight will prompt you to close the program when the updates are downloaded and when you do, it will ask if you wish PixInsight to restart itself automatically after updates are installed. The updates downloaded are applied when the program is closed. 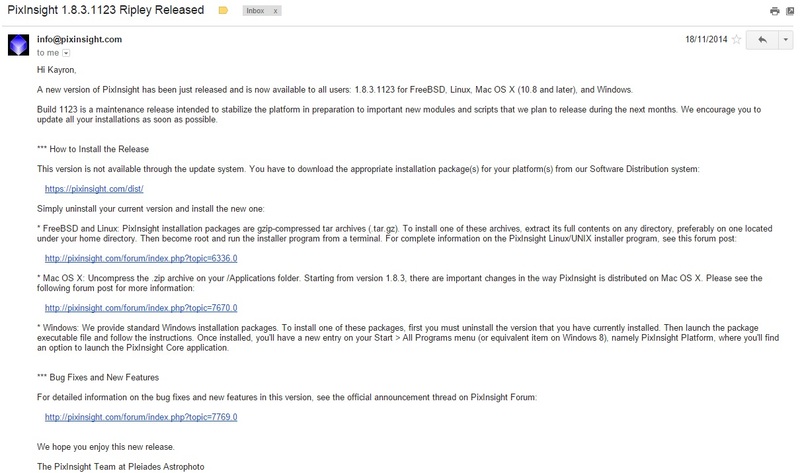 If there are currently no updates to your current installation of PixInsight, you will be notified as such. Keeping your installation of PixInsight fully up-to-date can be of critical importance depending on bug fixes and additional features made. In any case, the updates are free and do not take much of your time so there is no sense not applying them. 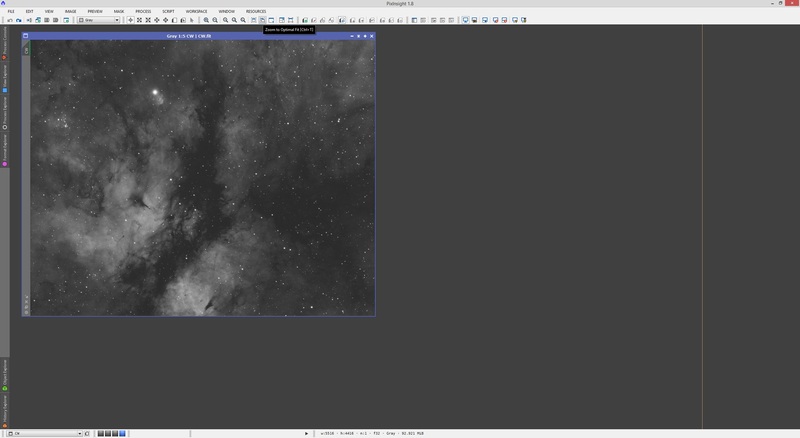 Though default settings work very well in PixInsight, you may wish to explore the current settings eventually (some of them may not make much sense to touch if you are a beginner, but you can revisit these later). 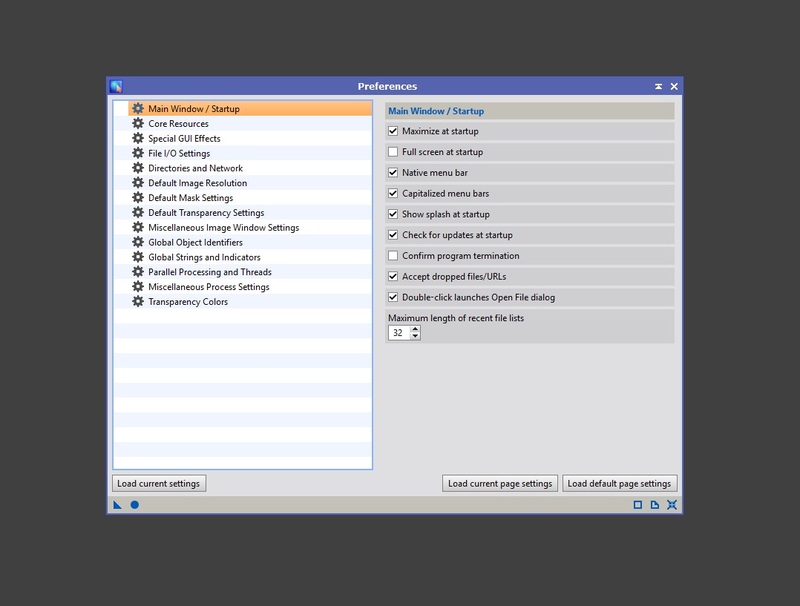 The settings are accessible through the menu Edit -> Global Preferences. Going through these settings categories and individual settings may be of interest to some. If you are unsure as to what a particular setting does, simply hover your mouse over the setting and a tooltip pops up to inform you. 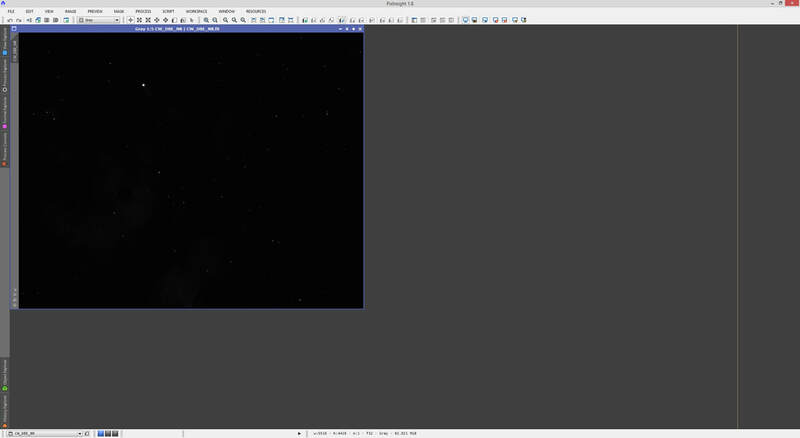 The one setting I do find useful to enable is Translucent workspace top-level windows in Special GUI Effects. As the tooltip explains, this allows you to overlay an image over another and while you drag an image, it becomes semi-transparent, allowing you to see the image below it. When you are happy with your choice of settings, click Apply Global button on the bottom. Now that we are looking through PixInsight's settings, it is a good time to explore its colour profile settings. 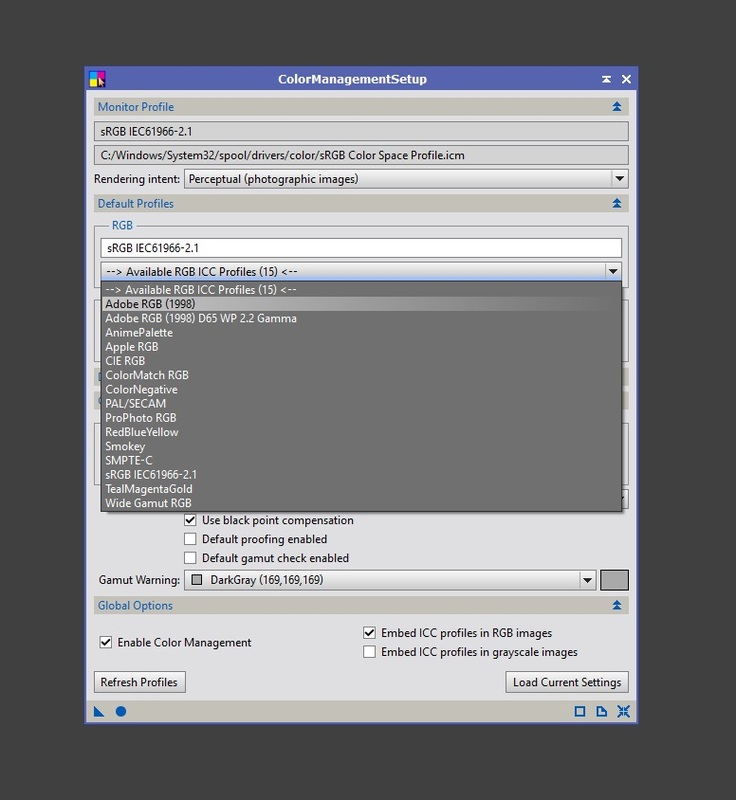 This is accessible through the Edit -> Colour Management Setup menu. 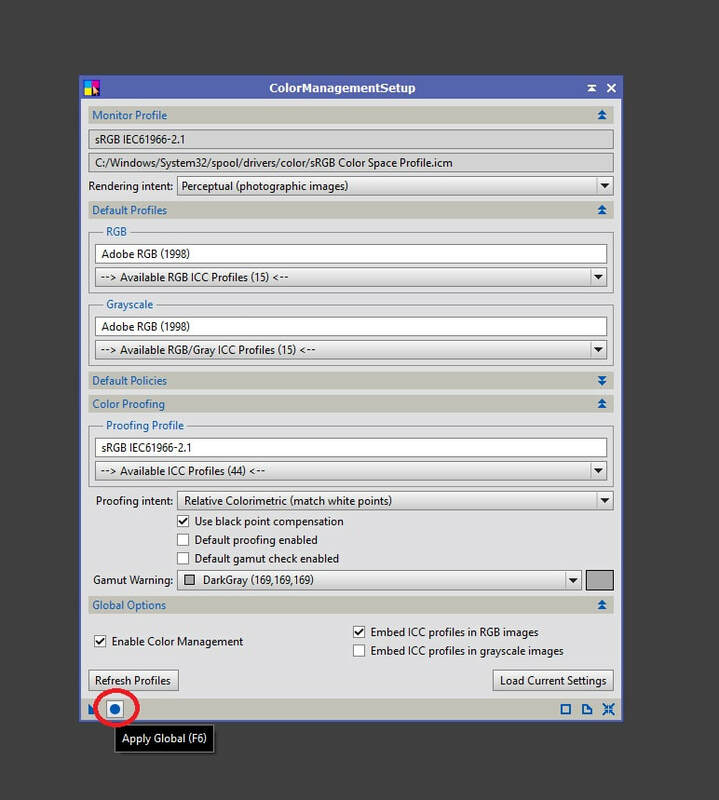 By default, PixInsight will be using the colour profile that is set to default in your operating system. Colour profiles define what constitutes colours and there are international standards that govern specific colour profiles. For example, the sRGB IEC61966-2.1 colour profile you see above is a standard colour profile used on the Internet. It therefore governs how colour images are displayed on the Internet and web browsers support this colour profile as a result. For working with colour images, the most appropriate colour profile is actually Adobe RGB. 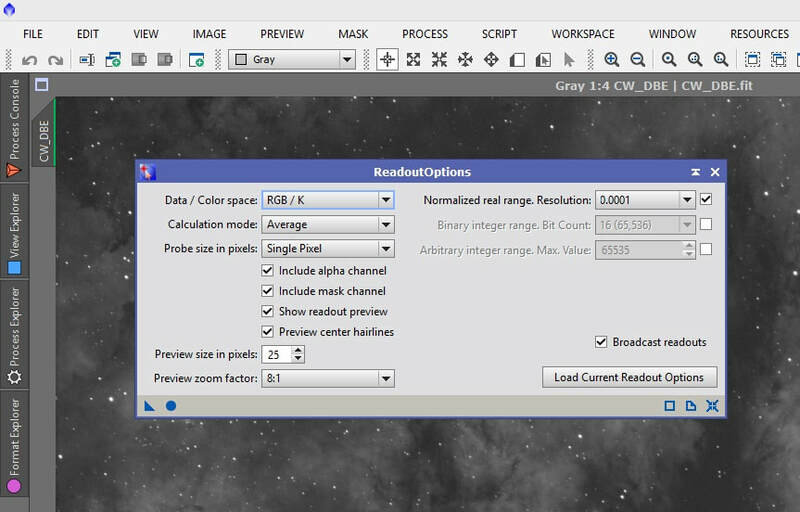 This can be selected for both RGB and Grayscale above as Default Profiles. Again, clicking the Apply Global button applies the new settings to PixInsight. 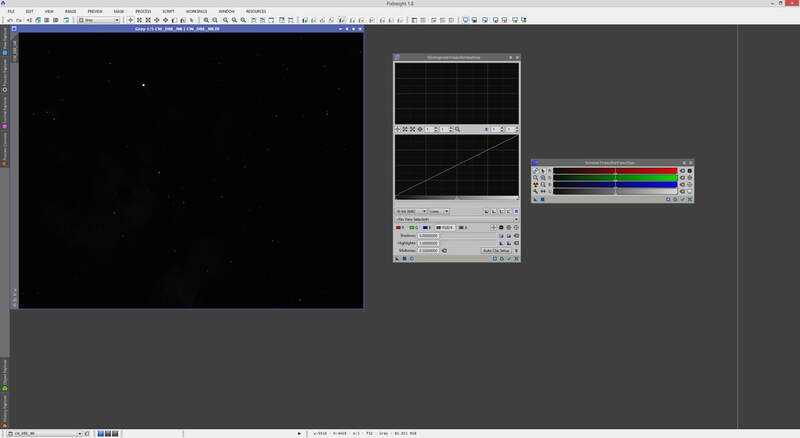 Of course, this means that when we are editing images, we will be working in the Adobe RGB colour space. Since no doubt your images will be published on the Internet later on and the standard colour profile on the Internet is sRGB IEC61966-2.1, we can keep that selected under Color Proofing. Color Proofing is a feature that allows you to preview how the image will look under a different colour profile. 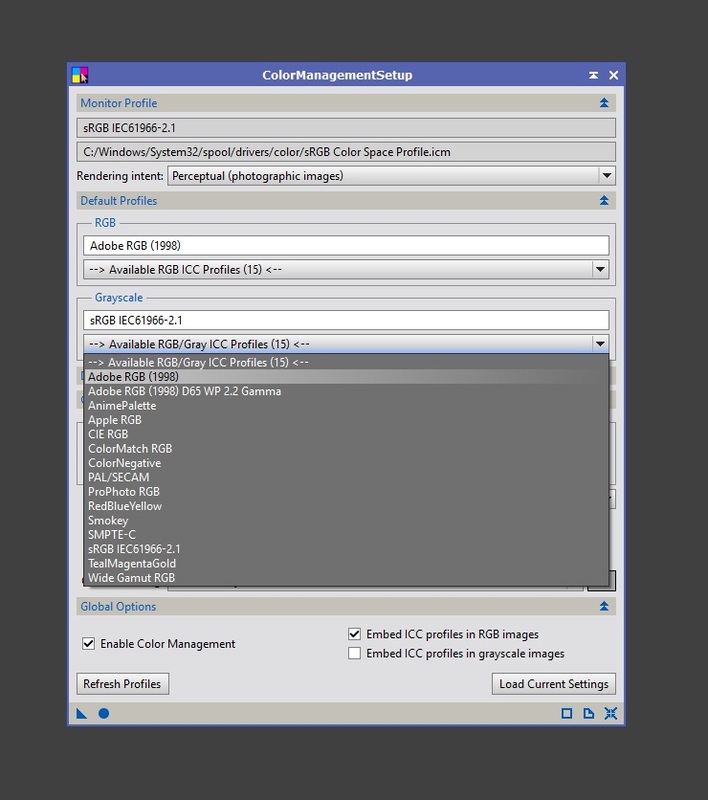 Though we will generally be working with images with the Adobe RGB colour profile, when saving it to publish online, we can easily convert the image's colour space to the Internet's standard sRGB IEC61966-2.1 colour profile. This is easily done with the ICCProfileTransformation process, which will be covered later. Since PixInsight's primary purpose is to work with images, we now explore this aspect. 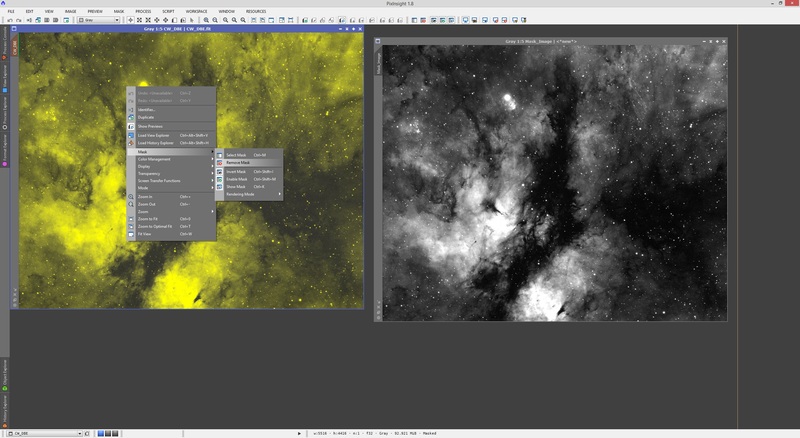 To open images, it is as simple as either going to the standard File -> Open menu, or double-clicking on the PixInsight workspace (the grey background). 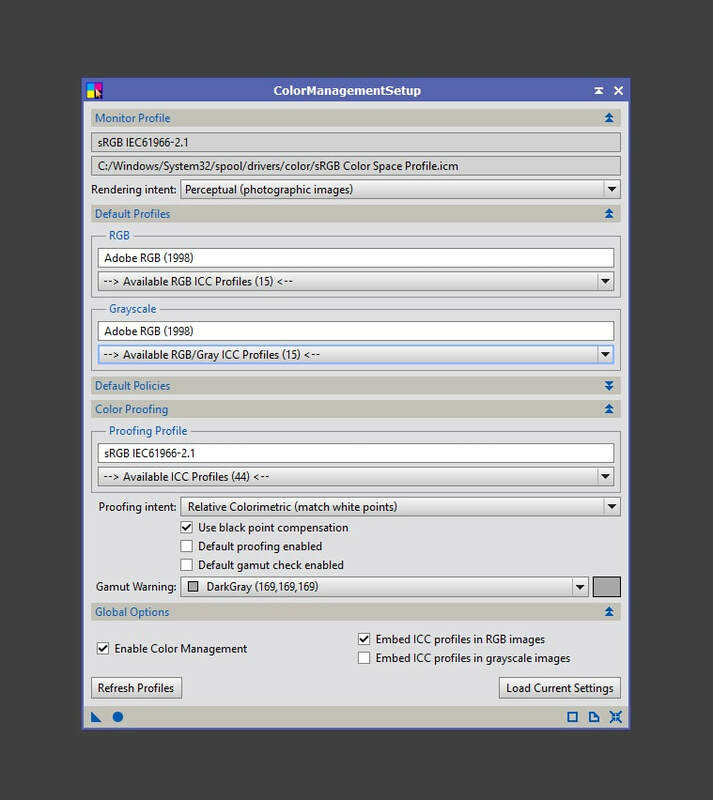 PixInsight supports a great variety of different image file formats without any extra plugins. That is one impressive list of image file formats supported - pretty much every DSLR RAW image file format in existence as well as the industry-standard FITS, used by CCD cameras. Common digital image file formats such as JPEG, TIFF, PNG, etc are also naturally supported. It is strongly recommended that you pre- and post-process (i.e. work on) images that are either DSLR RAW images or FITS images, depending on the capture camera used. The other file formats should only be used when the image post-processing is finished and you are publishing the image somewhere, like on the Internet. Keep in mind that unlike JPEG and PNG that are 8-bit formats, TIFF can be saved as 8-bit, 16-bit or even 32-bit format. This means TIFF can be used where you wish to retain greater colour accuracy, even if most monitors cannot display above 8-bit (professional monitors usually go as far as 10-bit, at present). 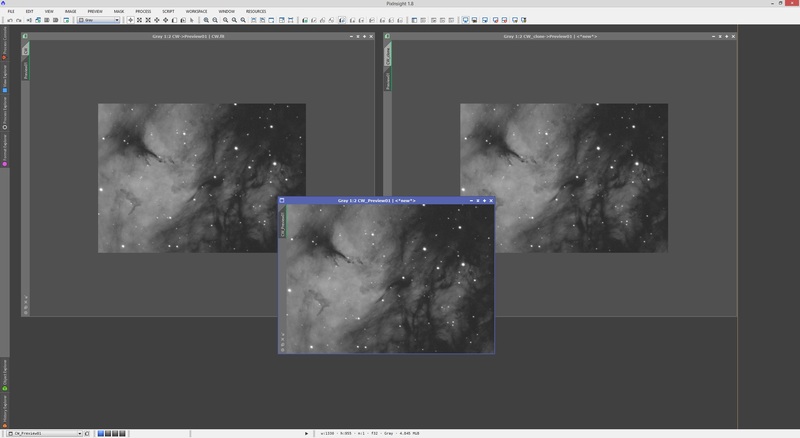 It is noted at this point that while PixInsight supports a great deal of image file formats to open, it will only save in a number of formats. If you are working with FITS images to start off with, I would keep to this file format without exception except when wishing to save another version of your finalised image for later publication. If you are working with DSLR RAW images, then I recommend saving as a FITS first and then working with this format from there on in. If we inspect the File menu closely, we notice two options, Open and Open a Copy. Both achieve what they are supposed to - open an image in PixInsight. However, Open opens the actual image file you point to. If you then make changes to the image and go to File -> Save, this will quite literally overwrite the image you opened with the changed version. To avoid this, you would need to use File -> Save As and save it as a different image file with either a different filename, in a different folder, or both. If we however use Open a Copy, PixInsight reads the image file itself but essentially creates an image within PixInsight that is identical. 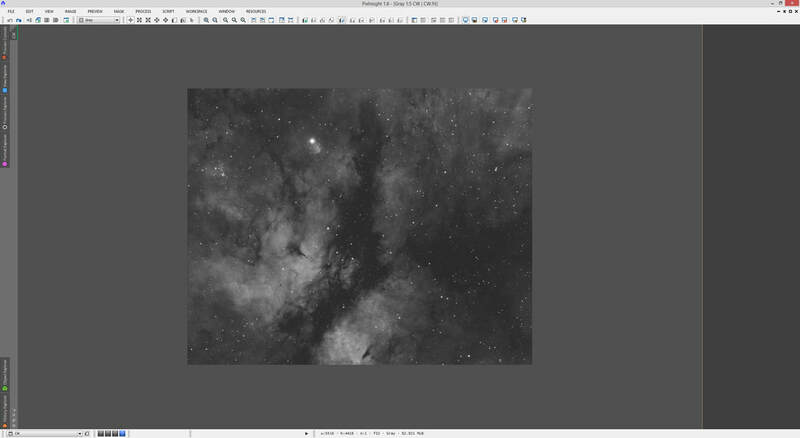 When changes are made to this image, the File -> Save option will remain greyed out (disabled) because PixInsight does not recognise the image as a file that already exists on your computer. This forces you to use File -> Save As, to save it as a whole new image file. You can of course opt to overwrite the original image with File -> Save As all the same, though. Some users may find this functionality useful. As most modern programs, PixInsight stores a list of recent files that have been opened and this is accessible via the menu File -> Open Recent. You can naturally use this to open up image files that have been opened prior, without having to look for them through your folders. The menu option File -> Clear Recent is also there to clear this list and renew it to its blank state. As you make changes to your images, you may wish to undo or redo a recent change. 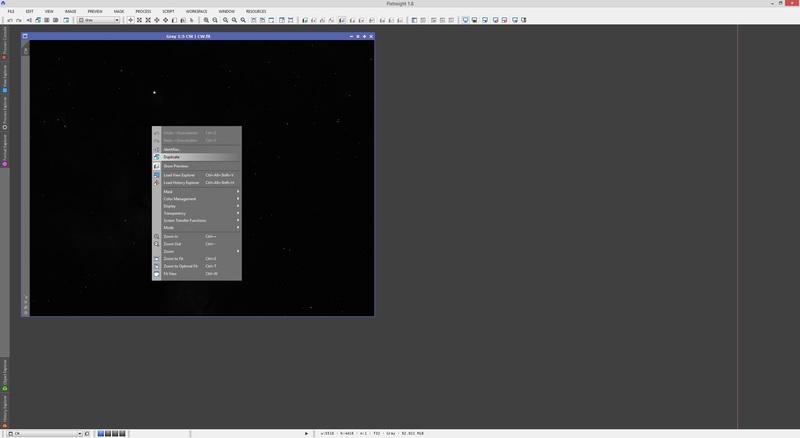 This works in PixInsight like it does in pretty much any modern program and is accessible through either the menus Image -> Undo and Image -> Redo or through the shortcut buttons below the menus. 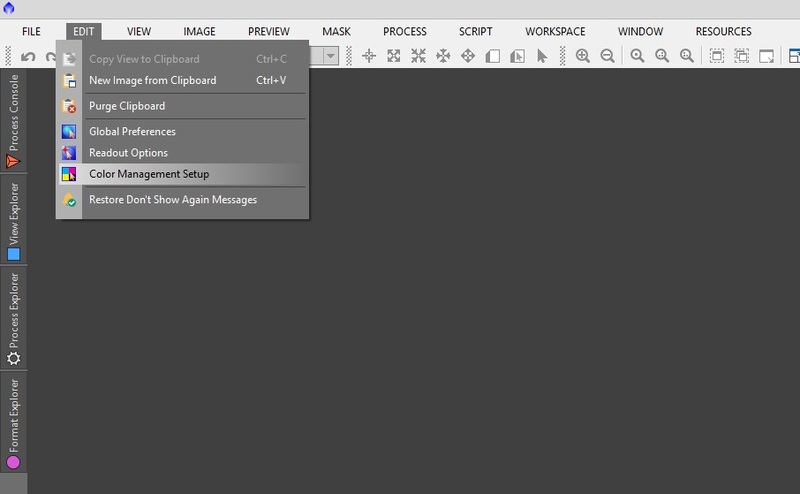 The keyboard shortcuts shown on the Image menu also apply. 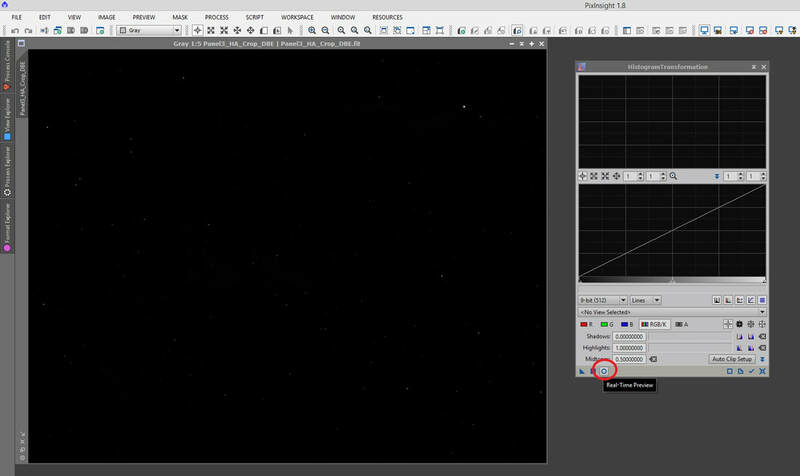 Images can be zoomed into or out from by using the mouse wheel while the mouse cursor is over the image open in PixInsight. Zooming in or out using the mouse wheel will automatically select the image that is currently below the mouse cursor, and carry out the zoom. By default, PixInsight has a Zoom toolbar above the open images. 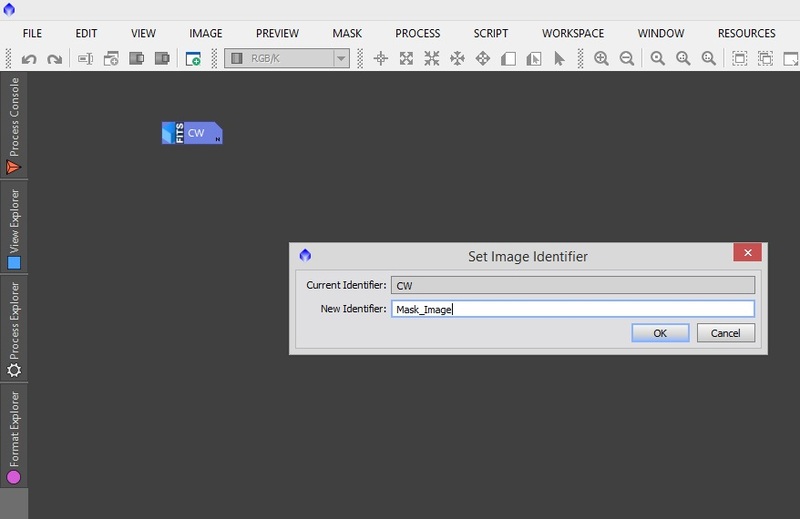 The shortcuts on this toolbar can also be clicked to zoom in and out, as well as to zoom the image to a level where it is displaying it in its full resolution, or half or double the resolution. The same shortcuts are available through the View menu, but accessing these through the menus is more cumbersome. This same Zoom toolbar contains a few other useful shortcuts that I use regularly. Namely, Zoom to Fit and Zoom to Optimal Fit. The first option (to the left), Zoom to Fit, enlarges the image window so that it fits as widely as possible in the space available on the workspace. The second option (to the right), Zoom to Optimal Fit, reduces the image window size to that of the default when PixInsight opens the image. Additionally, one may enlarge an image window to fit the entire workspace viewing area. This is done by clicking the Maximize button on the top-right corner of the image window. 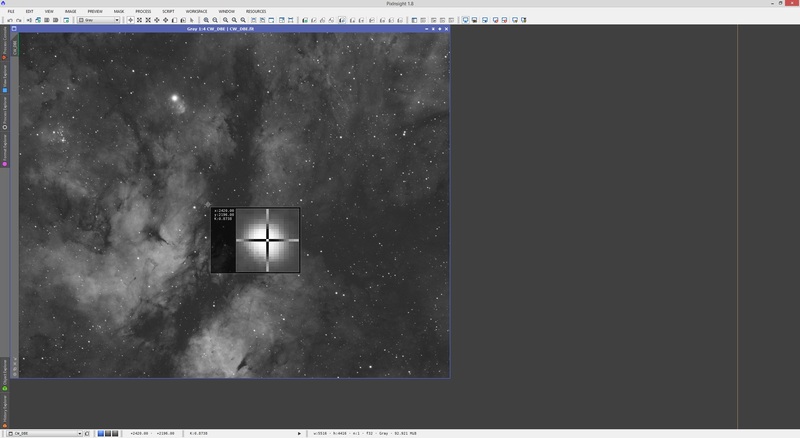 Notice now the image window has been enlarged only up to the point where the thin, vertical, orange line is located on the right of the PixInsight workspace. 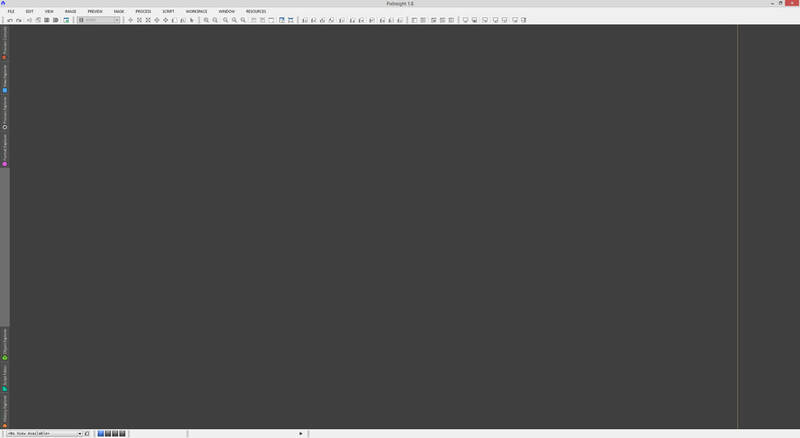 This is a separator line that gives you a working area of sorts, with the area to the right clear of maximised images. 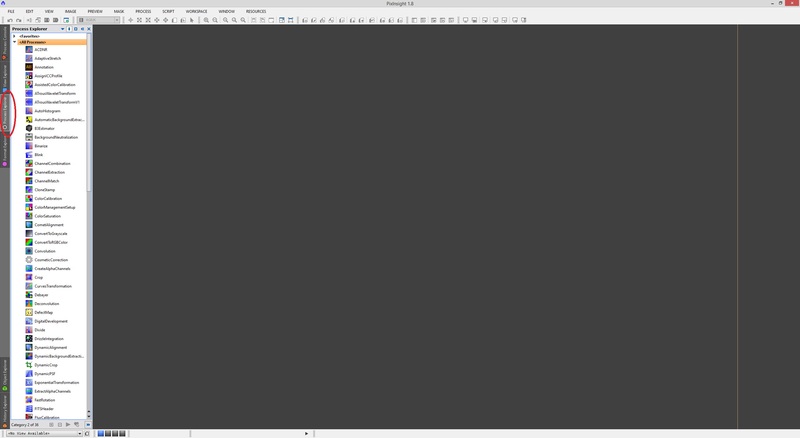 This clear area can then be used to list process icons or other images, minimised. We will explore process icons later on in this tutorial. With the image maximised, you may drag the workspace divider line left or right to decrease or increase the image viewing area to your liking. The maximised image will be forced to fit within this viewing area. 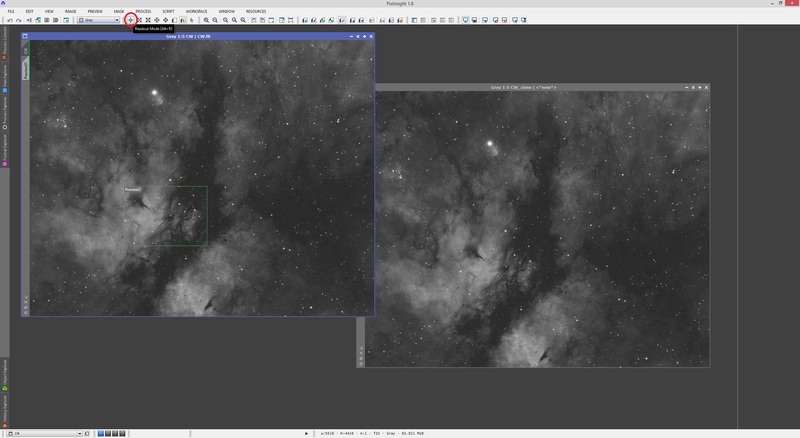 Maximised images can be put back into windowed mode by clicking the Normalize button to the top-right of the image (located just below where PixInsight is closed) or by clicking either the Zoom to Fit or Zoom to Optimal Fit shortcut buttons on the Zoom toolbar (or via the View menu). Images may also be minimised into icons that float around the workspace. This is done by clicking the Iconize button to the top-right of the image window. These icons (as PixInsight refers to them) are always on top (to coin a Windows term). If you open another image or try to place an image above it, the icon will essentially be on top regardless. Double-clicking these icons will open up the image window as normal, to the size that it was set to before it was minimised to an icon. While in its minimised state, you may right-click on the icon and go to Set Image Identifier if you wish to change the name referring to this image in PixInsight. 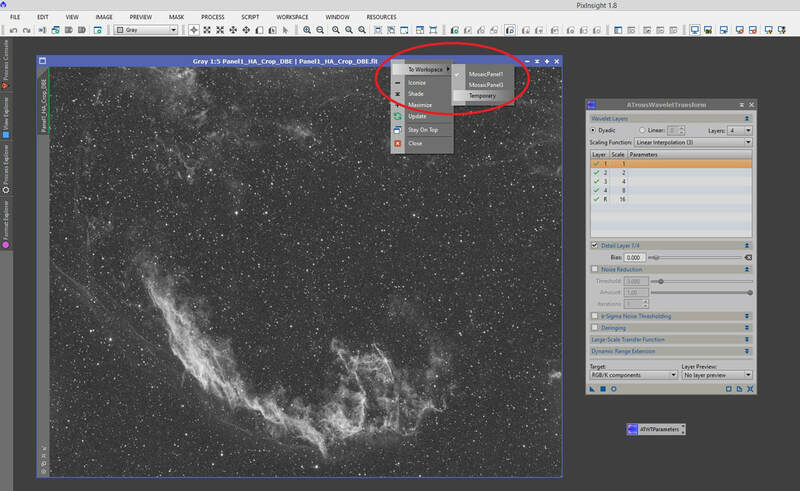 This can be very useful if you wish to rename an image within the PixInsight working environment, for easier selection later (e.g. for a mask). Please note that spaces are not allowed so capitalise or use underscores or dashes. 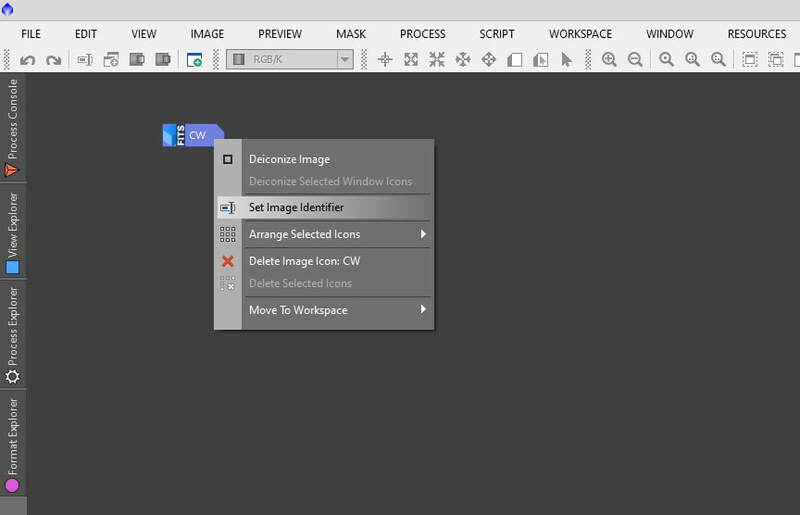 The identifier for an image can also be changed through the menu Image -> Identifier (applicable to the currently selected image window). Please note that changing an image's identifier in this way will not change the physical filename of the image on your computer. The identifier refers purely to what PixInsight calls this image. 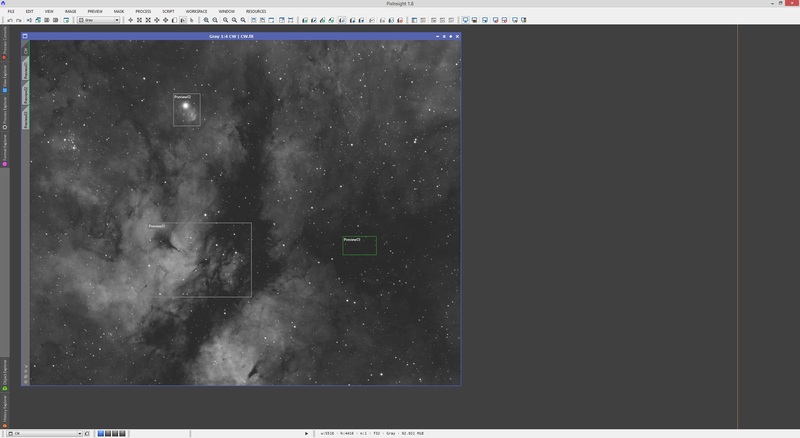 So far we have covered opening images as well as control zoom, how large the image window is and how to rename its identifier within PixInsight. You will however already know (or notice very quickly) that raw exposures you have just captured are extremely dark and lack contrast. Before any post-processing actually takes place, it would be ideal to inspect what the data looks like. PixInsight is capable of auto-stretching an image, without actually altering the image itself - all it changes is how the image looks to the user. To perform an auto-stretch, we use the STF AutoStretch button on the Screen Transfer Functions toolbar on the top. Please note that the image has not been altered at all. If you save the image as a new file, you will realise quickly that it looks just like it did before we performed the auto-stretch. 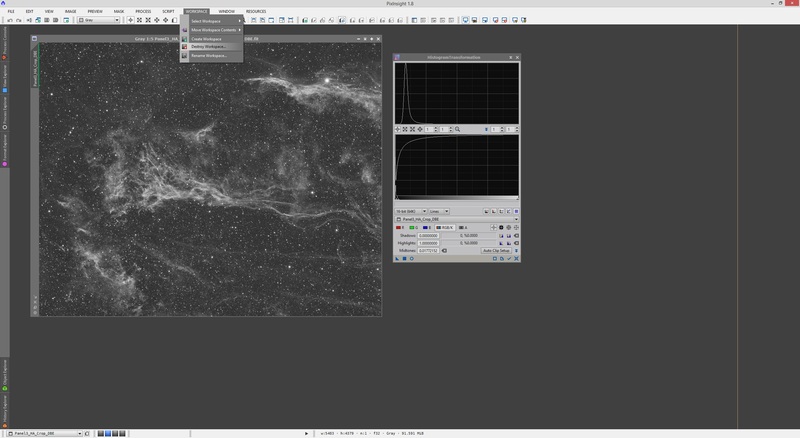 This function is available in PixInsight to allow us to work with the image while it is in what we call its linear state - before it is stretched out to boost contrast. For a much more dramatic auto-stretch, use the button immediately to the right of this one, called STF AutoStretch (Boosted). Please note that if you make changes to an image, even if subtle (e.g. small-scale noise reduction), you will need to re-apply the auto-stretch to see the changes it has made to contrast. You may reset the auto-stretch to remove it by clicking the Reset Screen Transfer Functions button on the same toolbar, to the left of the button used to auto-stretch. This button resets the auto-stretch on every single image that is currently open in PixInsight. If you wish to only reset the auto-stretch on the currently selected image window, use the button immediately to the right of it, called Reset Screen Transfer Functions: Active Window. If you wish to quickly make a copy of an image, you can do so by right-clicking on the image itself and clicking Duplicate. To do this, you may also simply drag and drop the image identifier from the image window on to the workspace and it will automatically create a clone. You may use image clones for all sorts of things, including to test out different process parameters and compare results, or simply to use the clone (or an altered clone) as a mask for the original image. Techniques related to this will be discussed in other tutorials. With an auto-stretch applied to both the original image and the clone, we can create preview boxes in PixInsight in order to encompass only a small segment of your image. To do this, we simply click the New Preview Mode shortcut button on the Preview toolbar. With this mode selected, we can drag a preview box within our image. 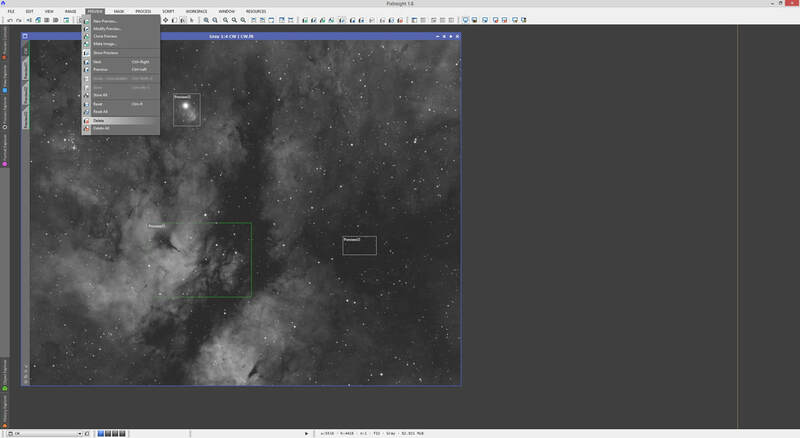 As soon as the preview box is created, PixInsight will be in Edit Preview mode. This allows you to drag the preview box created around the image to position it more carefully. You may also resize it by dragging any of its corners or sides in or out. Once you are happy with the preview box created, you can click Readout Mode shortcut button on the Preview toolbar to return to default (so you do not accidentally move the preview box). 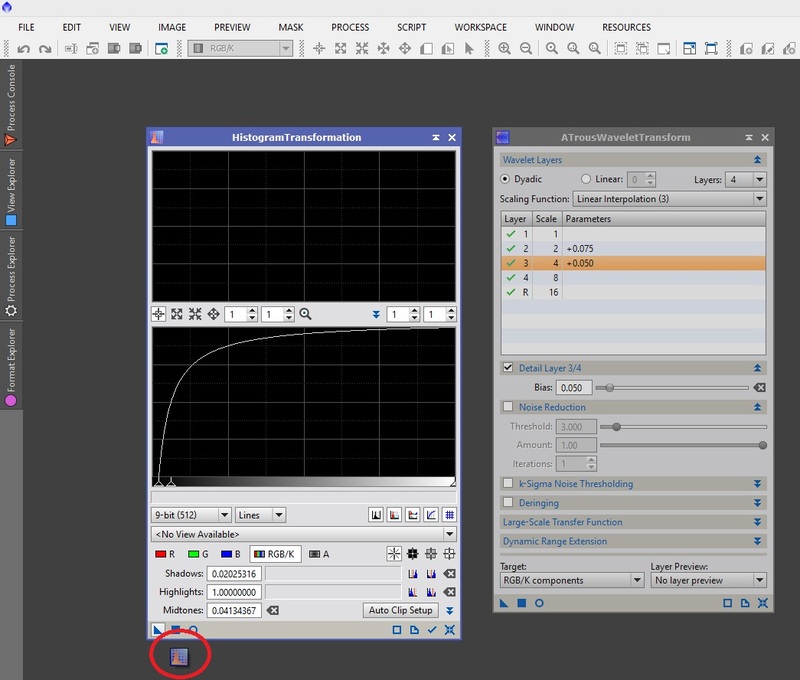 Preview boxes can be incredibly useful for various things we will explore in more detail in other tutorials. Namely, you can select the preview box alone to apply processes to, thus speeding up the processing (as the area being processed is much smaller) and it gives you a preview of the effects of your process' application. We may actually look at the preview box as if it were the entire image by clicking the new Preview01 identifier that appears below the image identifier. As we see above, if you hover the mouse cursor over the Preview01 identifier, we see a small preview appearing to show us what area of the main image the preview box actually encompasses. Clicking it displays only the preview box area of the image within the image window. This can be zoomed in or out (or Zoom to Fit / Zoom to Optimal Fit) in the same way the main image can be. If you click the main image identifier, it will return the image window to view the main image as a whole. The preview box will remain in place however. We can transfer preview boxes created in one image over to another image that is open, perhaps a clone. This is useful to make sure we can directly compare small areas of images. To do this, simply click to select the preview box identifier, in this case Preview01, and once the preview area of the image is being displayed, drag and drop this preview box identifier to the other image, just below that other image's main image identifier. 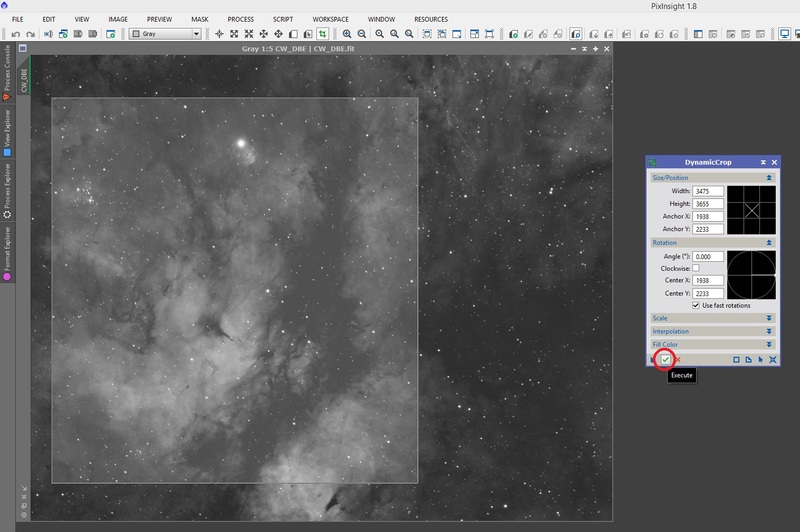 If the preview box identifier is instead dragged into the PixInsight workspace, it will create a new image window with the preview box's area of the image displayed in it. 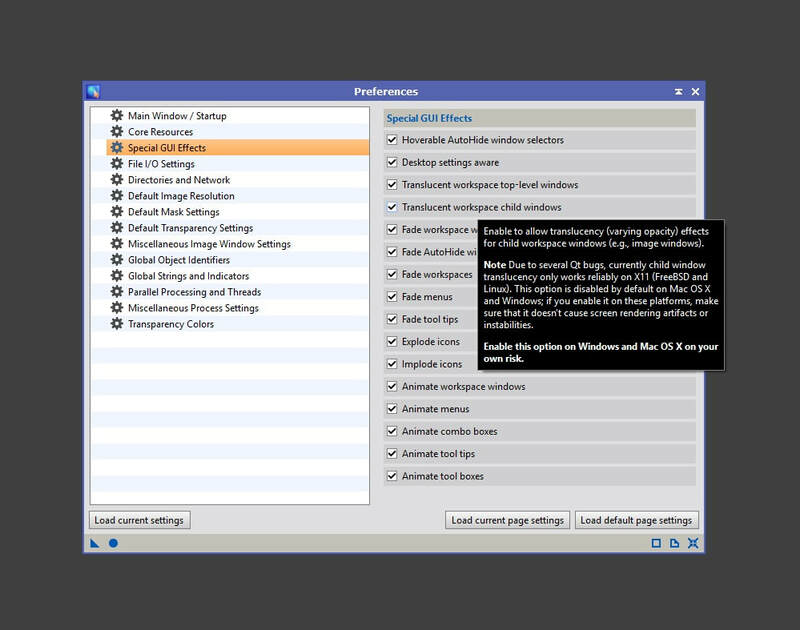 Images can have many preview boxes created within it. These preview boxes can also be renamed. For example, below I have used the New Preview Mode shortcut button in the Preview toolbar to create three preview boxes in the image. Let us say I wish to delete the first preview box, labelled Preview01, but I also wish to rename the smaller preview boxes to something more meaningful than Preview02 and Preview03. To delete Preview01, I stay in Edit Preview Mode (see the Preview toolbar - this mode is selected by default as soon as you create a preview box), I click to select Preview01 within the main image and its outline goes green once selected. Now we go to the Preview -> Delete menu to delete this preview box. It is important we avoid the menu option Preview -> Delete All unless we really do want every single preview box gone! Now that Preview01 has gone, I make sure I am still in Edit Preview Mode and then click to select Preview02 to rename it. To do this, once selected, I go to the menu Preview -> Modify Preview. Here, we can enter a new identifier for the preview box and confirm the changes. Please note that spaces are not allowed so capitalise or use underscores or dashes. Notice how other parameters can be altered as well. Specifically, one can enter particular pixel starting coordinates and preview box pixel size to change what area of the image the preview box encompasses. Feel free to play with this if you really want to be specific. All preview boxes can be deleted without having to select any by simply using the menu option Preview -> Delete All. So far we have covered New Preview Mode and how it is used to create preview boxes on images. Readout Mode was mentioned as the default PixInsight uses for user interaction with images, but what it can do was not detailed. Readout Mode is the default mode because it gives the user information about the pixel their mouse cursor is over, plus surrounding pixels. In order to see what it can truly do, simply left-click your mouse over anywhere on your open image and keep the left mouse button pressed. The pop-up is essentially Readout Mode's output. It shows the user a very zoomed in view of the pixel they are over and the surrounding pixels, with the precise pixel location of the pixel they are over. It also provides a value for the brightness of the pixel the user is over in the Readout Mode output, in normalised format (0 is black and 1 is white). For a colour image, this pixel brightness is given for all three individual colour channels (Red, Green and Blue). 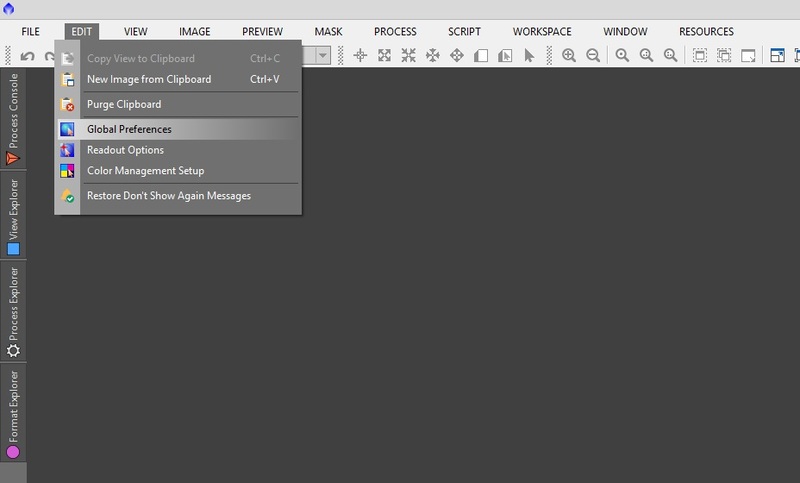 Readout Mode can be customised through the menu option Edit -> Readout Options. Here you may decide whether the brightness value given by the Readout Mode output is done on the single pixel you are hovering over, or an area of pixels as an Average, Median, Maximum or Minimum. The pixel probe size can be set to a single pixel, or a 3x3 square up to a 15x15 square. You may also alter the Readout Mode output size in pixels and the zoom factor. Customising this is up to you and what you select should certainly reflect how you wish to work with it. Experimentation is key. To set new settings, simply click the circle icon button Apply Global and close the window. I find the default settings but with a Readout Mode output size of 51 pixels is ideal for me. 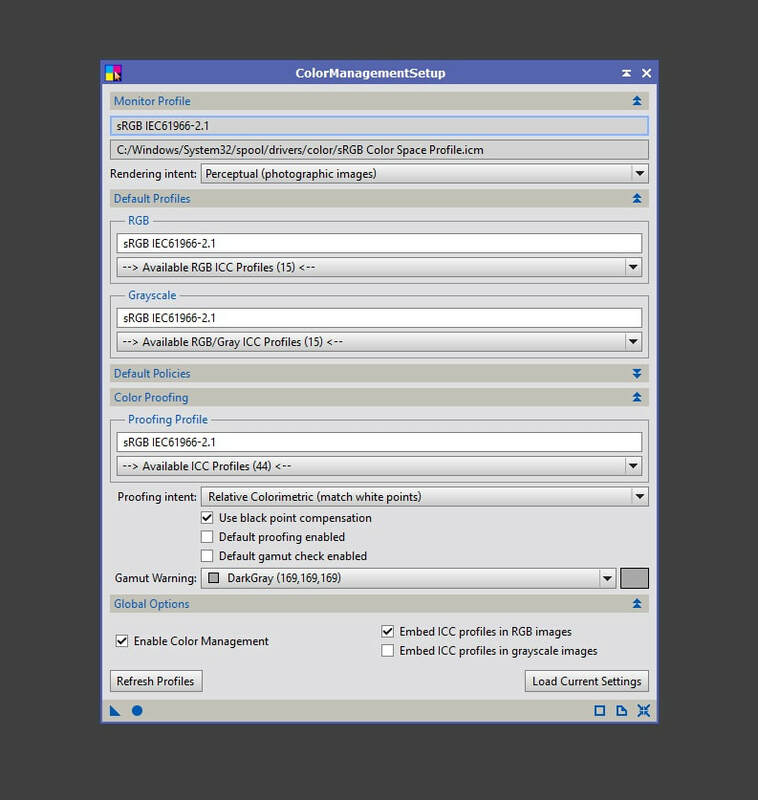 Just before finishing the section, we talk about image formats and here we very briefly touch upon processes in PixInsight. Images can be changed in bit-rate without having to save as a new image. 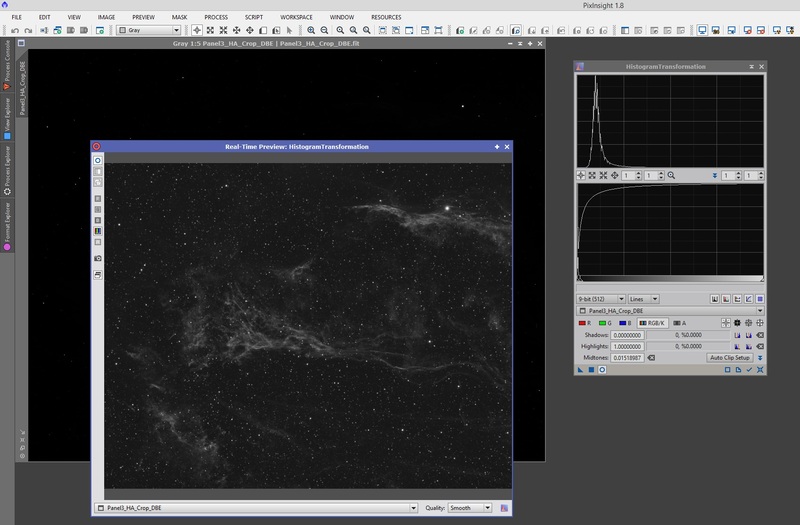 This can be done through selection of the PixInsight process called SampleFormatConversion. This is found through either the menu Process -> <All Processes> -> SampleFormatConversion or more specifically, through the menu Process -> Image -> SampleFormatConversion. By default, the SampleFormatConversion process has the image's current bit-depth format selected. Simply selecting a different bit-depth format and clicking the Apply button will convert the image that is currently selected. Of course, saving the image through the menu File -> Save As prompts the user to select a bit-depth format if the image format chosen calls for it. Selecting JPEG or PNG for example, will not prompt this as they are simply 8-bit image formats. 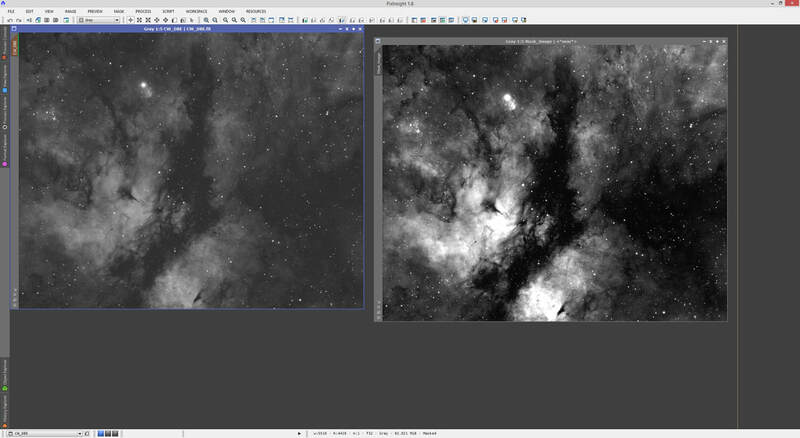 If you however select TIFF or FITS, PixInsight will ask what bit-depth format to save in. Selecting JPEG will actually prompt PixInsight to ask what quality setting to use. I recommend using 100 without exception. Please note that if you use File -> Save As to change your image's bit-depth format, you will need to close the image and re-open it through the newly saved file in order for PixInsight to be using the new image's bit-depth format. This is why the SampleFormatConversion process can be useful - it changes the bit-depth format of your image on the spot and allows you to work with it straight away without having to save and re-open anything at all. Lastly, we can inspect an open image's FITS header information within PixInsight. Images typically contain information entered by the capture/stacking software. This information typically consists of exposure time or total integration time, camera used, mount used, target coordinates in the night sky, etc. This information is accessible through the File -> FITS Header menu. Select this menu option with an image currently open and selected in PixInsight. At the very top of the FITS header window is a drop-down list. Here you will find the identifiers of all the images currently open in PixInsight. You may select another image from this drop-down menu to see its FITS header information. 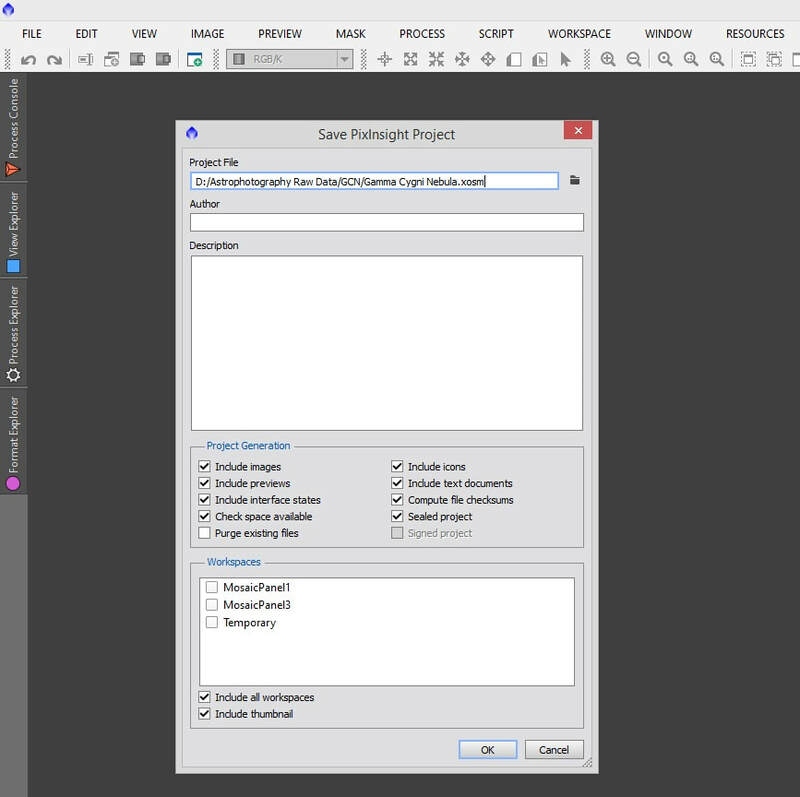 PixInsight lives on its processes and scripts - it is the way PixInsight processes images. Without them, it would be simply be an image viewing program as opposed to an image processing program. The difference between a process and a script is purely a formality. New functions coded into PixInsight can start as scripts and are then made into processes when the function and the code for it are formalised as a core feature of PixInsight. There are processes and scripts for everything you need to do to your images. 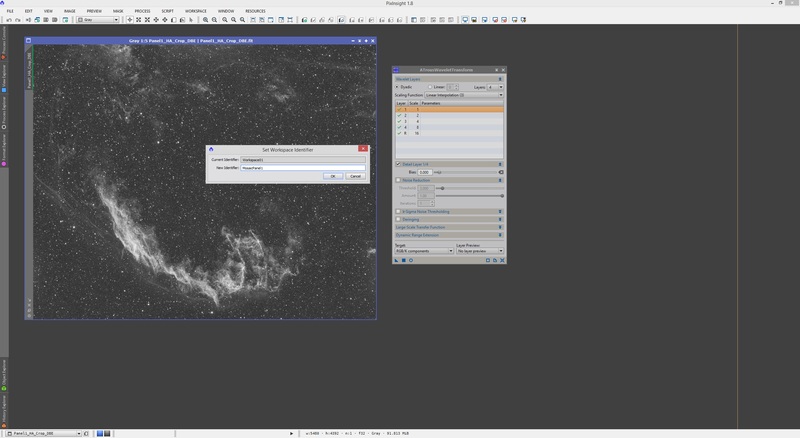 This section does not aim to teach you how to use each process and script that PixInsight offers - that would be extremely exhaustive and it is well beyond the scope of this tutorial. 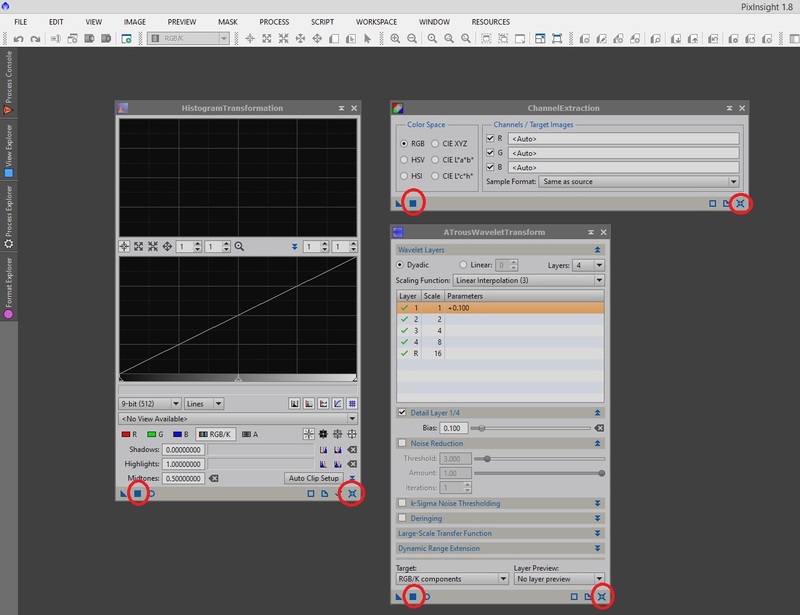 Uses for particular processes and scripts are the subject of other, more focused tutorials. 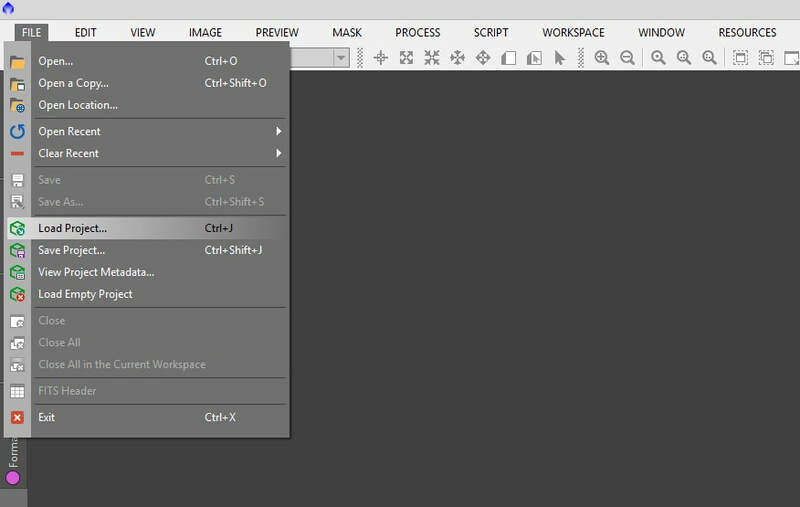 This section will instead go over how to access and interact with processes and scripts, as well as how to optimise your workflow with them. Processes are accessible through the Process Explorer to the left sidebar of PixInsight. These are listed in categories but I find it much easier to find them via the All Processes category, which contains every single one of them in alphabetical order. Once you get an idea of which one you want and what it is called, this is the easiest way to find the process you want. A quicker way to access the processes, I find, is through the menu Process. Here, all the processes are again listed in their various categories, or listed altogether through the <All Processes> menu. This is more accessible than the Process Explorer because it lists them all in one screen without having to scroll. They are also listed in alphabetical order. Scripts are accessed similarly, but they are unfortunately not as quick to find unless you know which category your script of interest belongs to. 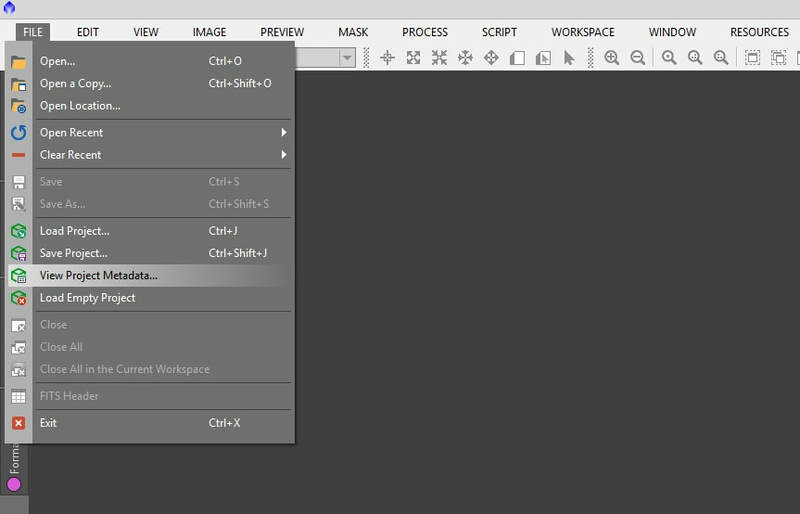 To access scripts, simply go to the Script menu. 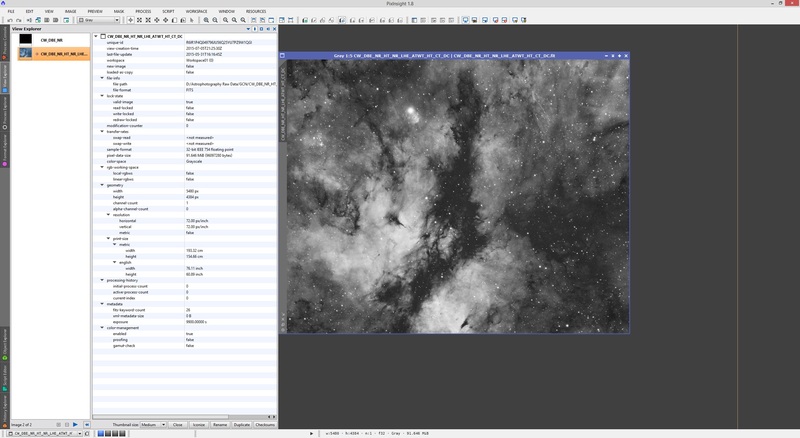 There are some very useful scripts already bundled with PixInsight and some of the more advanced users have coded their own, which are typically downloadable by users. One of the most useful scripts for DSLR users is the CanonBandingReduction script, which is extremely effective at removing the ugly bands DSLR RAW images can suffer from. Due to the formality of processes, they all have a specific layout with very common features and functions. Scripts on the other hand can vary greatly, depending on who coded it and how they coded it to function. For example, let us open the HistogramTransformation process. This particular process is used to stretch out images permanently (in contrast to the aforementioned auto-stretch), to bring out the details in images and boost contrast massively. 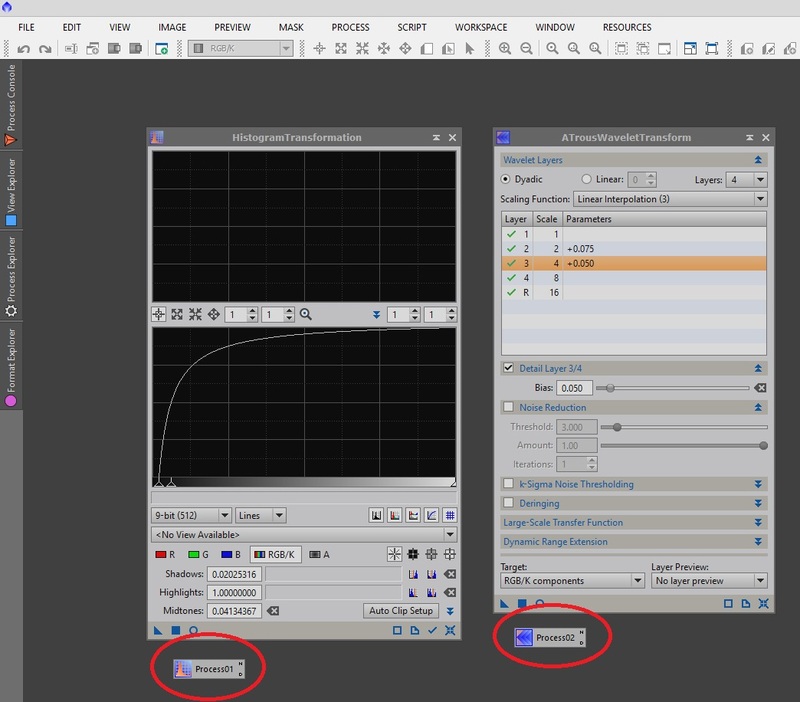 What we need to pay attention to for this tutorial however, is the bar at the bottom with the various buttons. If we open other processes alongside HistogramTransformation, we begin to notice the similarities. ​Above are several processes shown. There are two types of process - dynamic and non-dynamic. The vast majority of processes are non-dynamic. This means that they are simply a little tool window you can keep open on the side and apply to an image without needing to interact with the image itself. Due to this, you can have as many non-dynamic processes kept open at once. Dynamic processes are different in this however. They work by starting a session on an image. This session allows the user to apply the process to the image by interacting with the image. 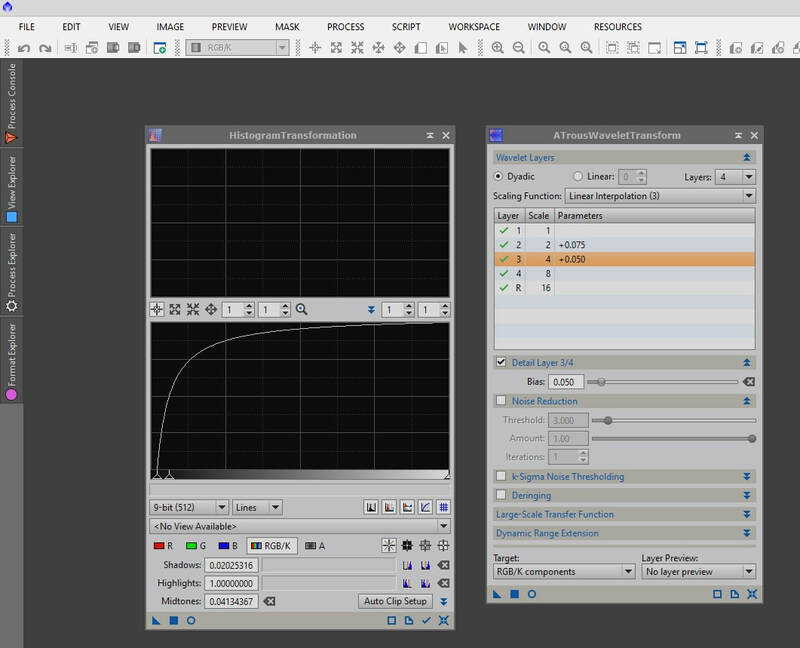 For example, DynamicCrop shown above is a dynamic process (hence the name!) and when initialised on an image, will show a white rectangle within the image that the user can drag to resize to choose how much to crop the image by. This is in contrast with non-dynamic processes that require no interaction between the user and the image itself. This is also why you can only have one dynamic process open at once. Notice above how DynamicCrop has a slightly different set of buttons along the bottom bar compared to the other four. Let us first concentrate on the non-dynamic processes (i.e. not DynamicCrop). The two main buttons you need to be aware of are the Apply and Reset buttons. The Apply button is the little square to the left and the Reset button is the little cross to the right. These buttons do what you would think they should do - the Apply button physically applies the process with its set parameters to the image window that is selected, and the Reset button completely resets the process' parameters to defaults. The little triangle button to the very left, called New Instance, is extremely useful as well. For example, say you are post-processing monochrome images and have cropped your Luminance image in a certain way and are post-processing your Luminance image completely. 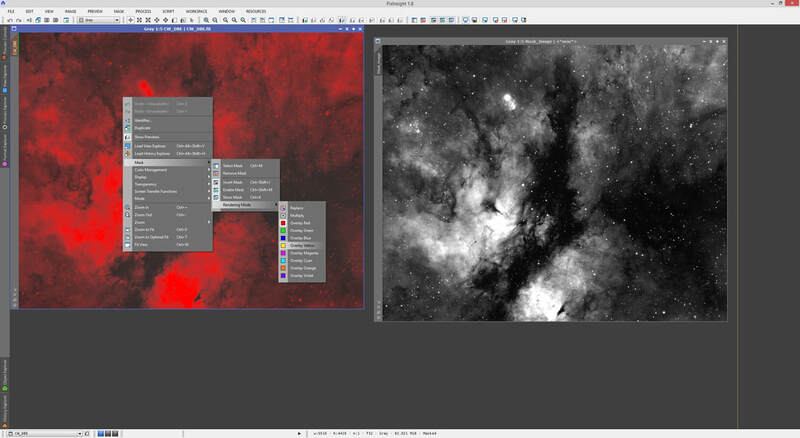 Much later on, your intention is to post-process your RGB colour image completely and on its own, with a combination of Luminance and RGB to follow. However, you are concerned that the crop you applied to Luminance may not be identical to the crop applied to RGB later, which could pose serious problems! This is where New Instance can help you out. Let us use HistogramTransformation and ATrousWaveletTransform as examples here. Let us suppose that you are applying a specific stretch with HistogramTransformation and then sharpening the image with ATrousWaveletTransform. Below shows what kind of settings might do that. 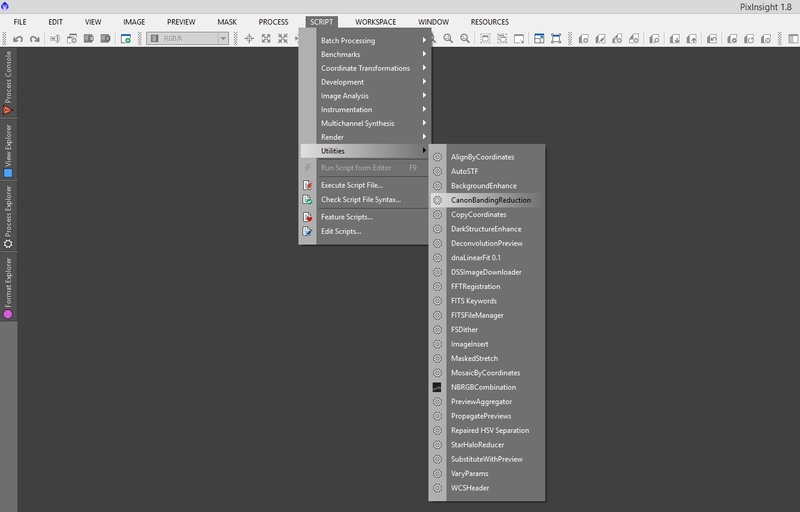 To save the process parameters for each, all I need to do is drag and drop the New Instance button of each of these processes to the workspace. 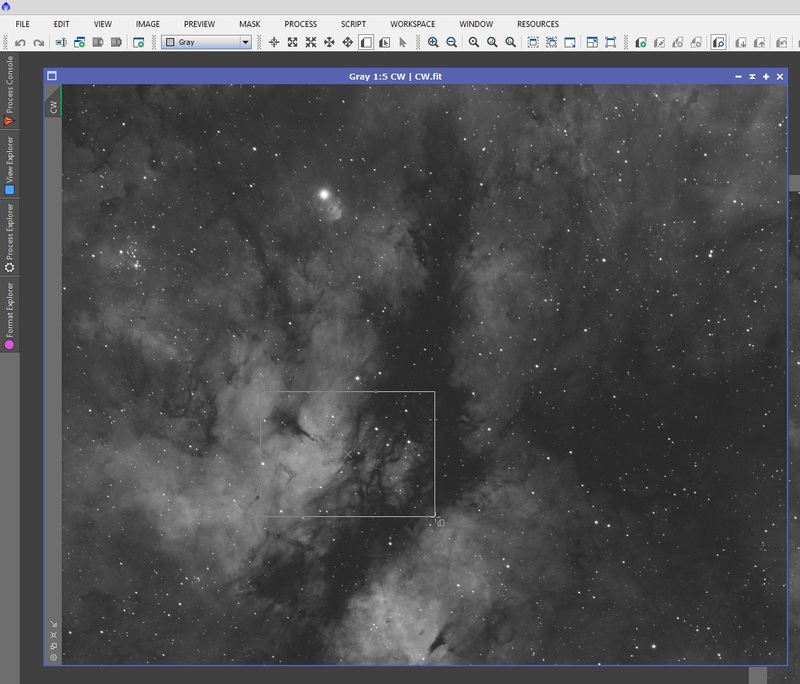 This will create a PixInsight process icon. These can be renamed to something more meaningful by right-clicking and going to Set Icon Identifier, renaming it there and confirming. Please note that spaces are not allowed so capitalise or use underscores or dashes. The processes HistogramTransformation and ATrousWaveletTransform can now be reset, closed, etc - these process icons have stored my parameters for each one. The process icons can be set aside by dragging them anywhere you like. To apply them to an image, all you need to do is either double-click them to open the process they are related to and then click Apply in that process, or simply drag and drop the process icon itself on to the images you want to apply it to. 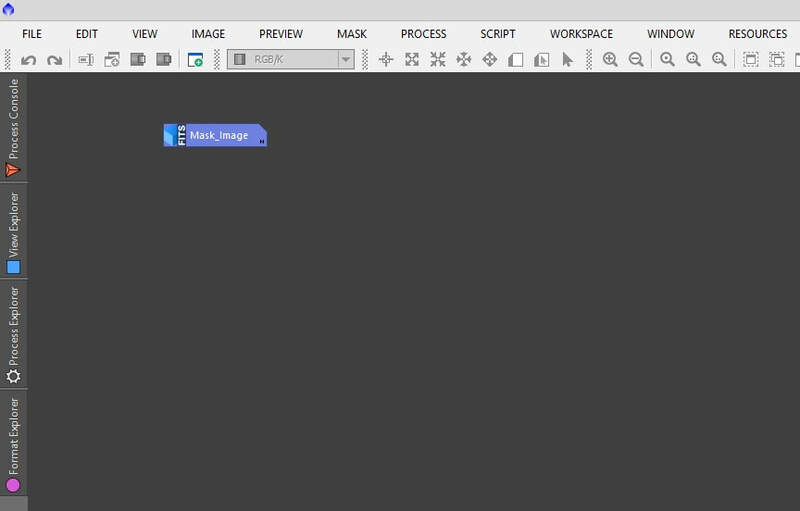 Interestingly, without creating a process icon, you may drag and drop the New Instance button from an open process window on to an image to apply the process to the image. This does not create a process icon at any point - it is simply another manner of applying a process to an image. It does seem to make things easier when you need to apply a process to many images, as selecting each individual image and clicking Apply takes longer than just dragging and dropping the New Instance button to each image, one by one. A nice thing about these New Instances of processes is that once you develop a good idea of how to post-process images, with some of the variations one can have in a number of processes due to the data quality or target content, one can have a long list of process icons listed. These are basically prepared to you to simply apply to images straight away or better, open up by double-clicking them, tweak a little if needed and then Apply. Having these set out could even be a reminder to you of what to do first. 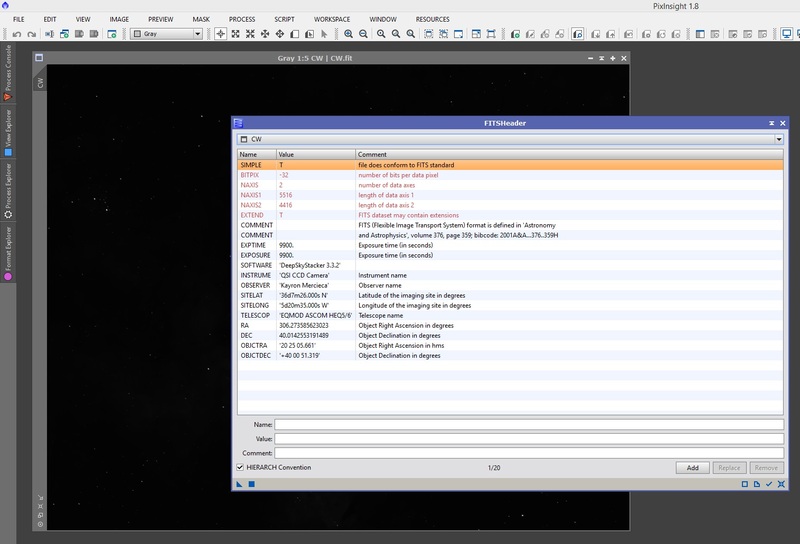 Later on in this tutorial, we will discuss PixInsight projects - what they are for and how to use them. We can however save our process icons themselves independent of any images or projects we are post-processing. To do this, we create the process icons and set them out nicely how we like them. Once we are happy, we simply go to the menu Process -> Process Icons -> Save Process Icons. 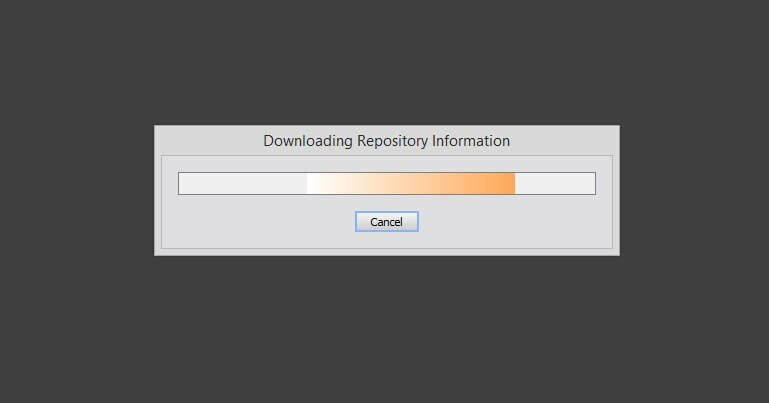 A file will be created with your chosen filename and in your chosen folder, containing all the information for loading later on in whichever project you choose to load them into. The possibilities are endless as you can have a different set of process icons prepared for different types of targets (e.g. small galaxies and large extended nebulae), or for different types of imaging (e.g. narrowband or LRGB, monochrome or One Shot Colour). 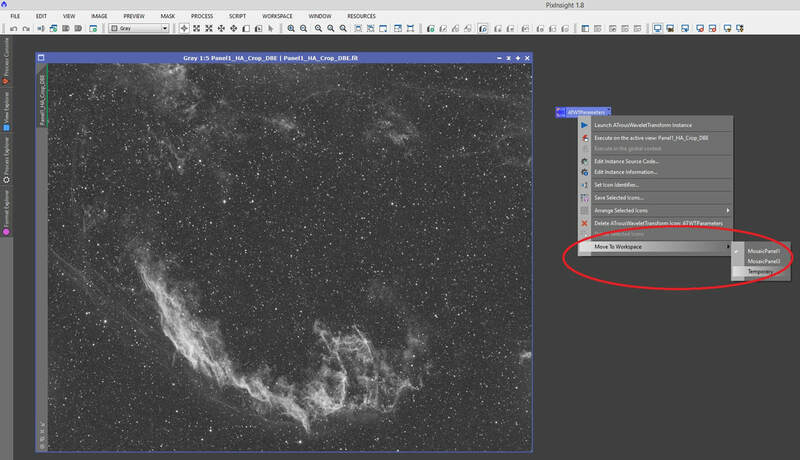 Process icons can be loaded to your PixInsight workspace through the menu Process -> Process Icons -> Load Process Icons, pointing to your chosen saved process icons file. Interestingly, one can also merge process icons. For example, you may load one process icons file and decide you wish to add in another set of process icons you have on another file. 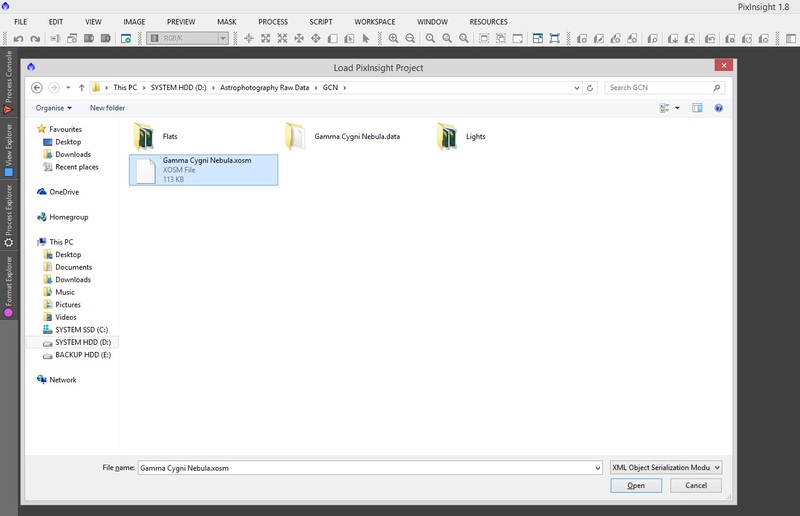 Simply load one of the files and then use the menu Process -> Process Icons -> Merge Process Icons to load a second one but merge it with the present set (rather than replace). The merge itself can then be saved as another process icons file, if you wish. If you get tired of certain process icons, you may delete them by right-clicking and selecting the delete option relevant. Naturally, the process icons files can be backed up and even shared between users. You will find some people share their process icons freely, or to support others on forums, for example. 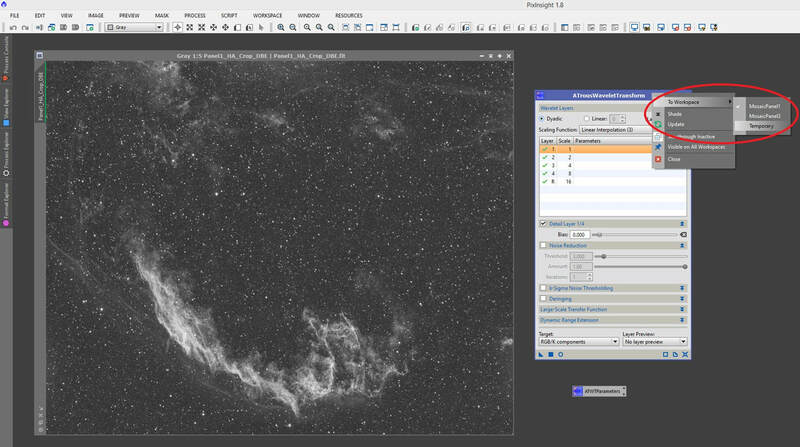 You may not wish to make use of this functionality of PixInsight, but knowing how to deal with New Instances for processes is extremely beneficial to most workflows. Without being specific to particular processes, we have adequately covered most non-dynamic processes thus far. Please note that some non-dynamic processes do have some extra functionality, like providing a real-time preview of changes that would be made if the parameters were applied as chosen. One such process is HistogramTransformation, in fact. This is accessible through the hollow circle icon on the left. Real-time previews are extremely useful for the processes it is available for, so if you see this available, you should probably use it! Once you are happy with what you see, you must click Apply on the process to actually apply the parameters to the image. The real-time preview window can then be closed once you are done. Dynamic processes do differ somewhat in the buttons available. Since these processes work by initialising a session on an image window, they work alone and if you try to open more than one dynamic process at once, PixInsight will not let you. In dynamic processes, the apply option is more aptly called Execute, symbolised by a green tick button. The red cross button to the right of it, called Cancel, does just that - it closes the session on the active image and closes the process entirely as a result. Dynamic processes can initialise a session simply by interacting with an image while the process is open, or by selecting an image and then clicking the process' Reset button. This will activate the process window and provide all the parameters it offers. Just as with non-dynamic processes, dynamic processes can be saved by creating a New Instance of it (by dragging and dropping its New Instance button to the workspace). These can then be interacted with in the same manner as well - by double-clicking to open the process itself (it will activate a session on the currently active image if you do this) or by dragging and dropping the process icon itself on to an image. 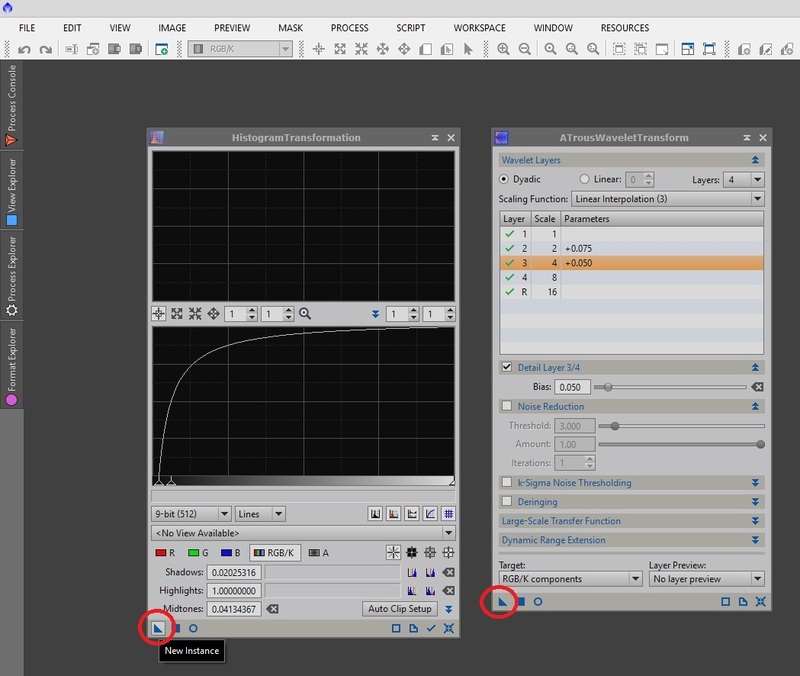 Before we come to a close on this section, on the topic of dragging and dropping process icons, we can actually transfer parameters from one process to another like this. For example, you can use the ScreenTransferFunction process to auto-stretch an image, precisely like the STF AutoStretch toolbar button does (they are one and the same). You may wish to take these auto-stretch parameters and actually apply them to an image permanently - to physically stretch the image, rather than just auto-stretching it to see how it looks while keeping it linear. 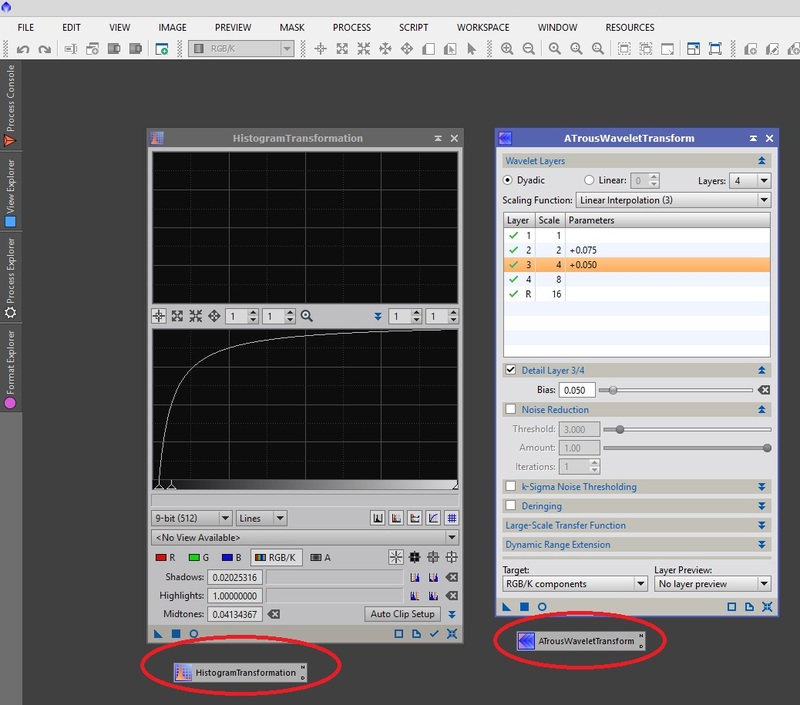 This example will demonstrate the concept of transferring parameters between processes via dragging and dropping. We start with a linear image that has not been stretched or auto-stretched. We can perform an auto-stretch to take a peak at it, sure, but what if we want to use this auto-stretch but to actually stretch the image? For this we open both, the ScreenTransferFunction and HistogramTransformation processes. As standard practice, I also click Reset on both to make sure they are at their defaults. To auto-stretch the image, I will keep the image window selected and then click the Auto Stretch button on ScreenTransferFunction. 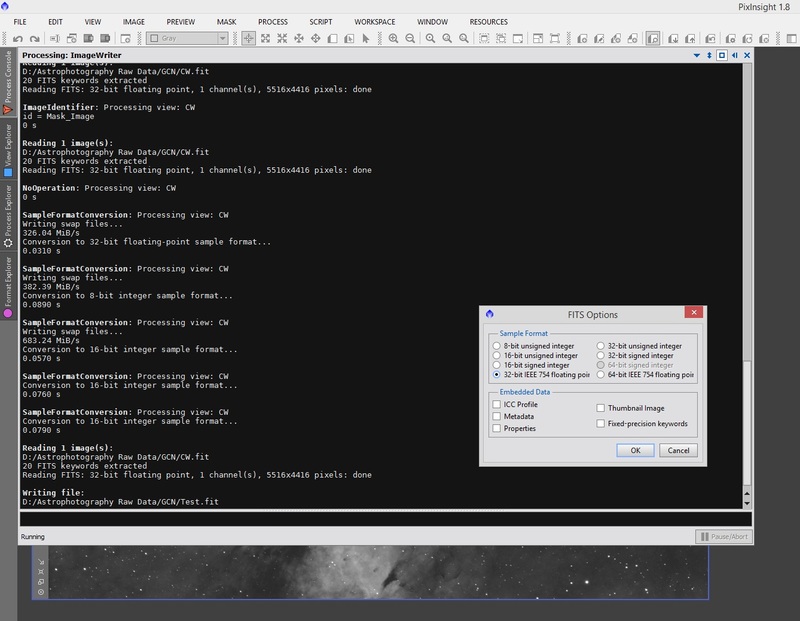 Now for the important procedure - transferring the parameters calculated by ScreenTransferFunction to HistogramTransformation (which will carry out the permanent stretch of our image). To do this, we drag and drop the New Instance button from ScreenTransferFunction on to the bottom bar of HistogramTransformation, in-between all the standard buttons at the bottom. 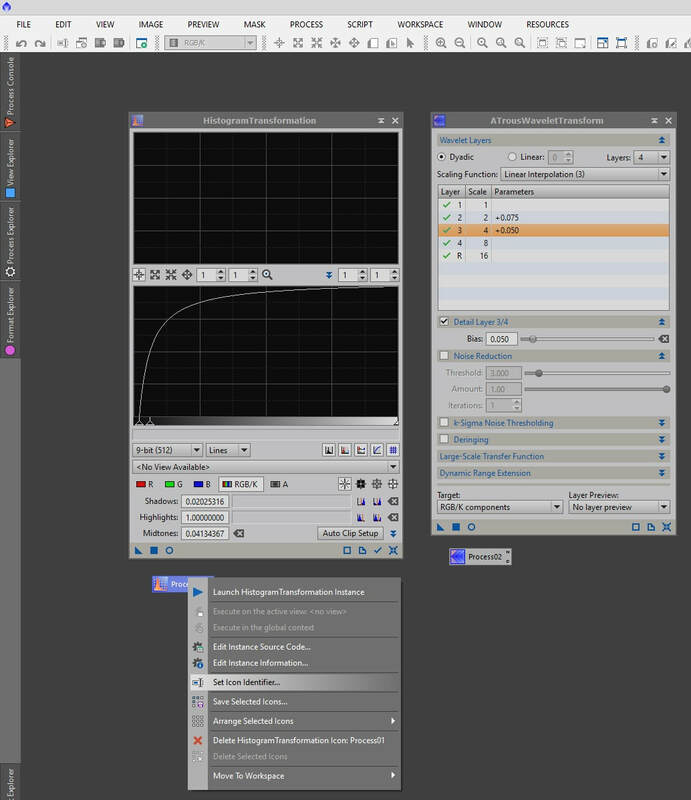 You immediately notice that HistogramTransformation has changed to display the stretch being applied. Clicking Reset on ScreenTransferFunction removes the auto-stretch on our image and then clicking Apply on HistogramTransformation applies the same parameters, but as a permanent stretch to the image. The image may look the same as before, but that is entirely the point - it has been stretched in the same way, but permanently to take it out of the linear state it was in before. There are limitations to this technique of transferring parameters from one process to another. Not all processes are compatible with one another, for obvious reasons. 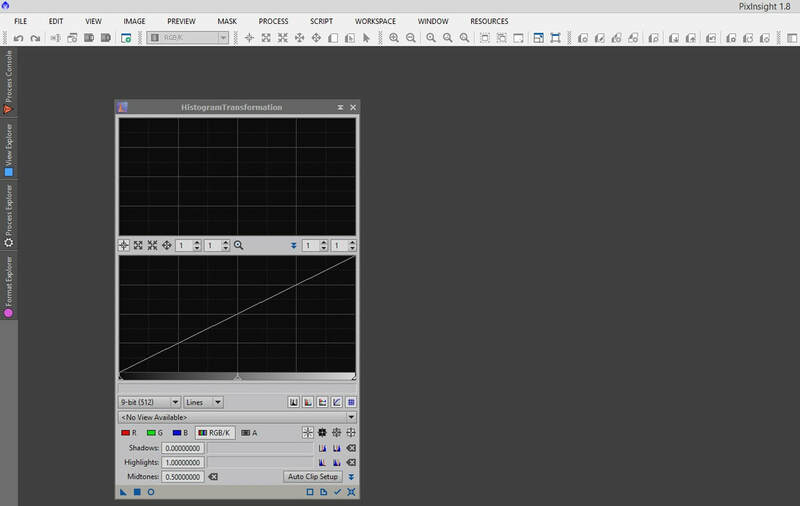 For ScreenTransferFunction and HistogramTransformation are compatible because they are based on the same parameters - stretching parameters for an image. As an example, ScreenTransferFunction and ChannelExtraction are not compatible because ChannelExtraction is used to separate out RGB/luminosity/chrominance channels from an image. When you attempt to transfer parameters from one process to another by dragging and dropping the New Instance button from one process to another, you will get feedback as to whether or not it will work. When it will work, the New Instance icon you are dragging will have a little square icon below it, indicating it can be transferred over. If it will not work, it will have a little cross icon below it. This little cross icon also appears if you are attempting to drop it somewhere else other than the bottom bar of the process you are transferring parameters to. An error will accompany dropping the New Instance icon to a process it is not compatible with. An interesting point to close this section with is that though processes can be applied to images themselves, they can also be applied to preview boxes within images. To do this, simply click the preview box identifier on the left, just below the image identifier. Once the image window shows only the preview box area, then applying the process will apply it strictly to the preview box alone. Your actual image is left intact, without having applied anything (do not think that only that area of the image has had the process applied to it - that is a subject matter for masks!). This helps as some processes do take a while, even on powerful computers, particularly when the images are massive (e.g. mosaics). It helps to apply processes like these to preview boxes to observe what the changes will be like to areas of interest. Once happy, you can apply the process to the actual image and be done with it. Scripts do not need to be covered on their own because they are very much independent in how they function. Experience with particular scripts you may be interested in using is key to success. Some of my other tutorials will cover the use of some of the more useful scripts. 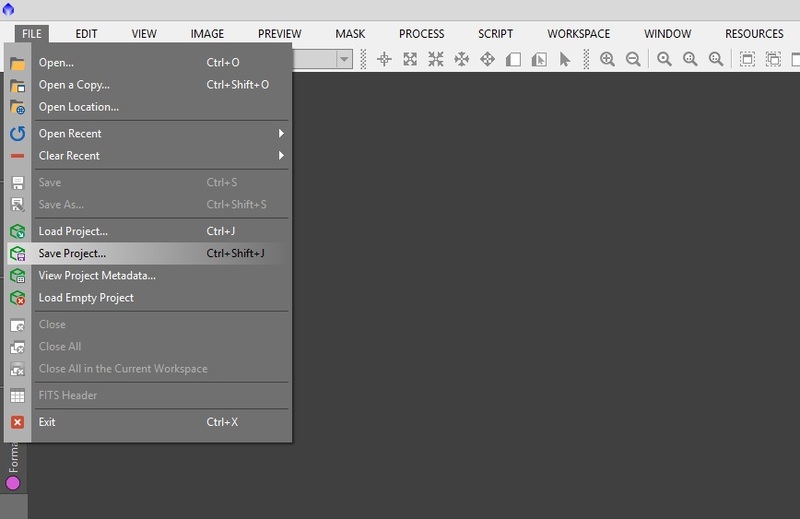 Most scripts simply have OK and Cancel buttons to apply or close the script, with some parameters that can be edited. 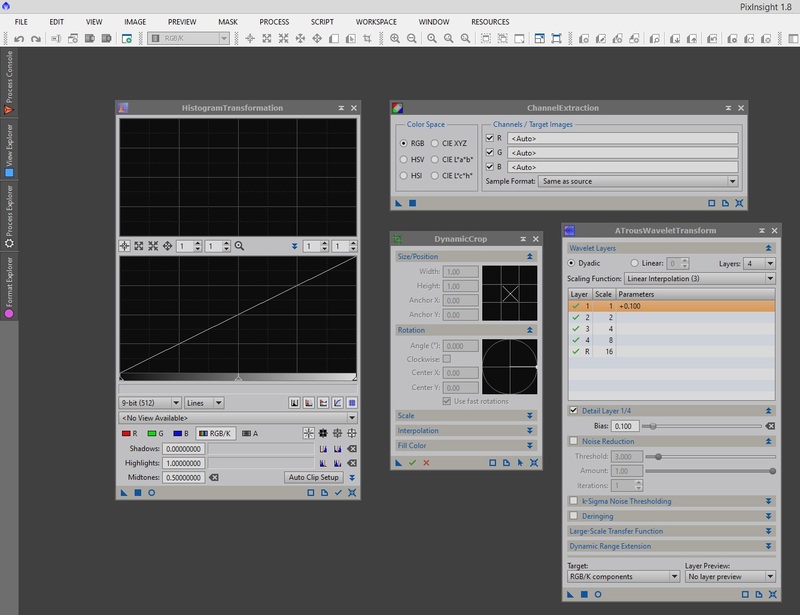 However, since some of them are not coded by the PixInsight team, their interfaces will naturally vary from one to the next. Since they are bundled with PixInsight however, they are proven to work well enough for inclusion in the default installation. 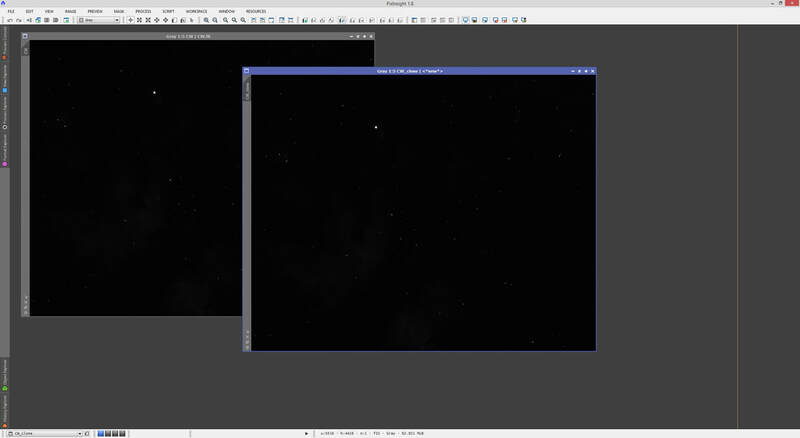 Workspaces in PixInsight are essentially desktops. In a project, you may be post-processing an image for a channel in one workspace while keeping another channel's image in another workspace (this could be Luminance in one workspace and RGB in another). Workspaces could also temporarily hold certain images you have open, such as masks. 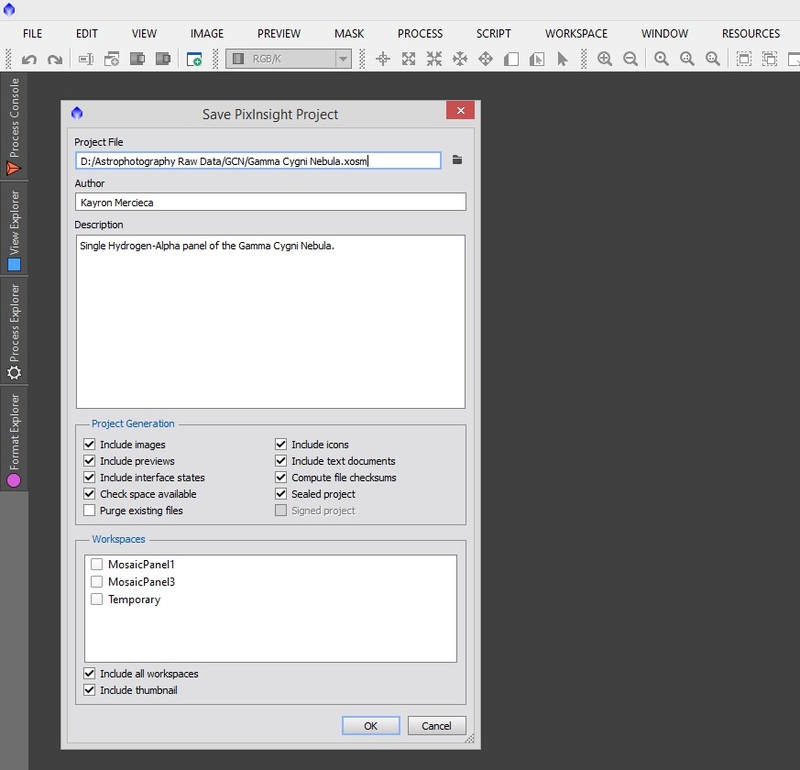 Workspaces have the most use when you work with images as projects, which is a subject of discussion later on in this tutorial. 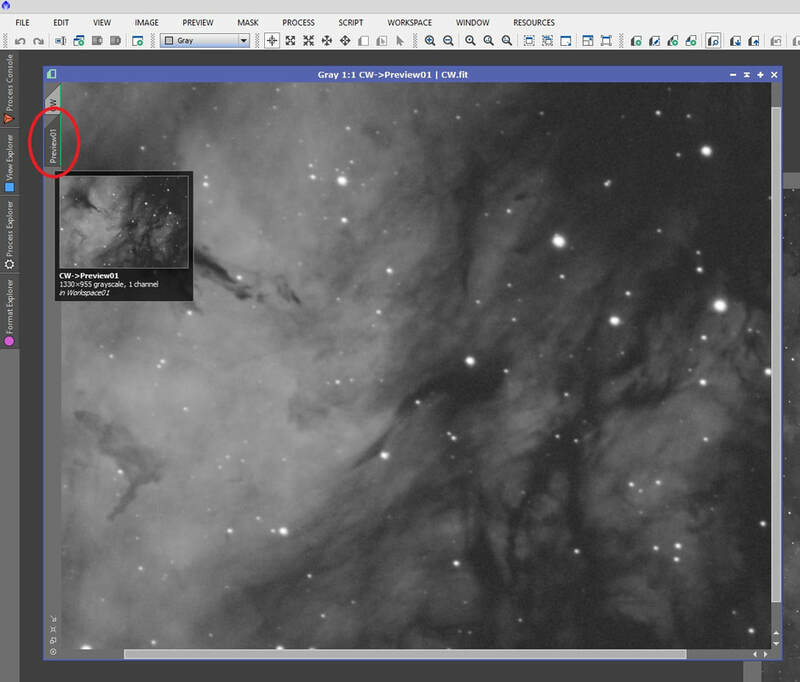 As aforementioned, the various workspaces can be accessed via the workspace shortcuts on the bottom of PixInsight. Clicking any of these buttons will transfer you to the corresponding workspace, while keeping everything in your current workspace active as well. 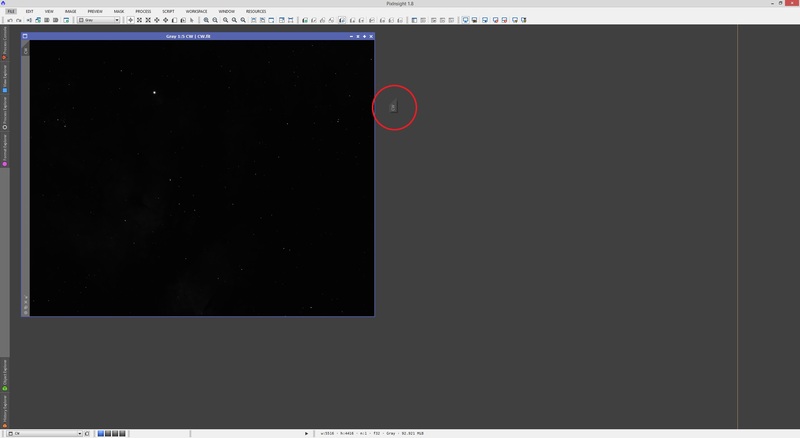 As seen above, hovering the mouse cursor over a workspace shortcut button will pop up a preview of what is currently contained within that workspace. Workspaces can also be accessed via the menu Workspace -> Select Workspace, selecting the corresponding workspace listed there. 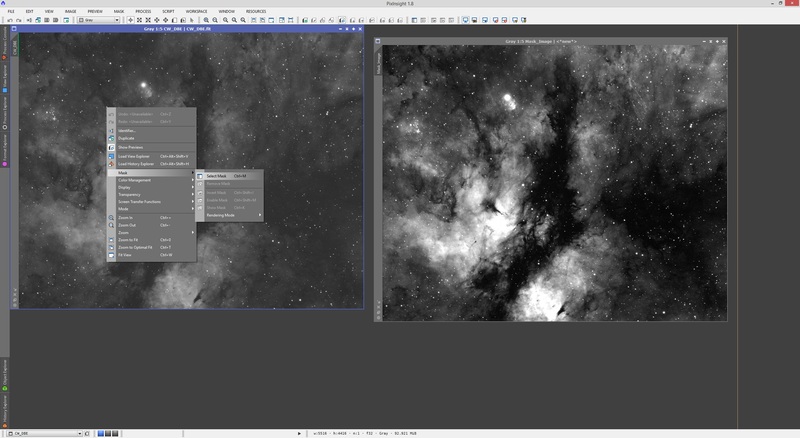 By default, new PixInsight projects are started with four workspaces available. You may delete workspaces by going to the workspace you wish to delete and then accessing the menu option Workspace -> Destroy Workspace. You will be asked to confirm that indeed you wish to delete this workspace, as doing so will remove the images and processes (or image/process icons) open within that workspace. 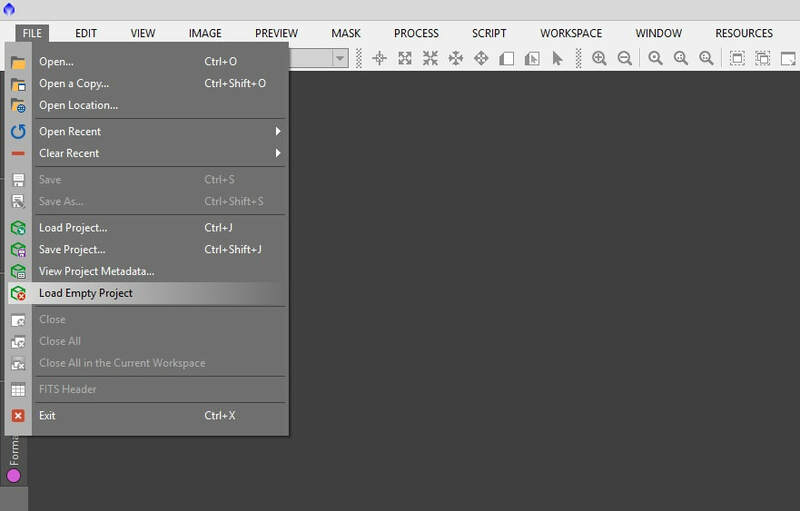 You may also create new workspaces via the menu option Workspace -> Create Workspace. Clicking Create Workspace will create a new workspace immediately, without confirmation, and transfer you to it. You may also rename workspaces to something more meaningful than the default names of Workspace01, Workspace02, etc. This is done by selecting the workspace you wish to rename first and then selecting to the menu option Workspace -> Rename Workspace, entering a new name here and confirming. Please note that spaces are not allowed so capitalise or use underscores or dashes. 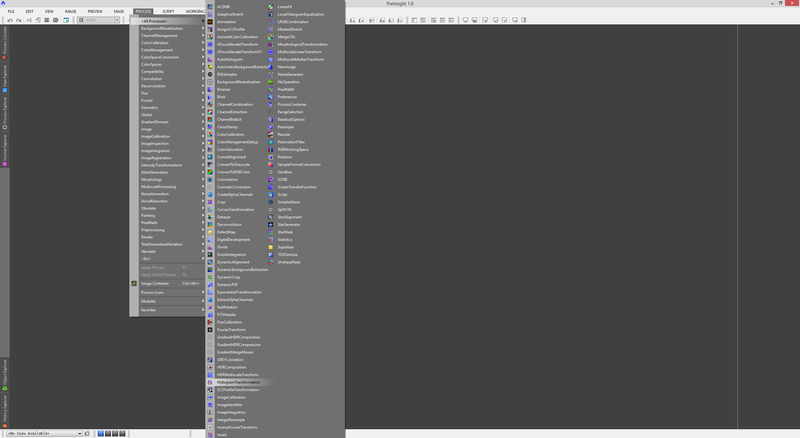 Renaming workspaces makes things very efficient when navigating. 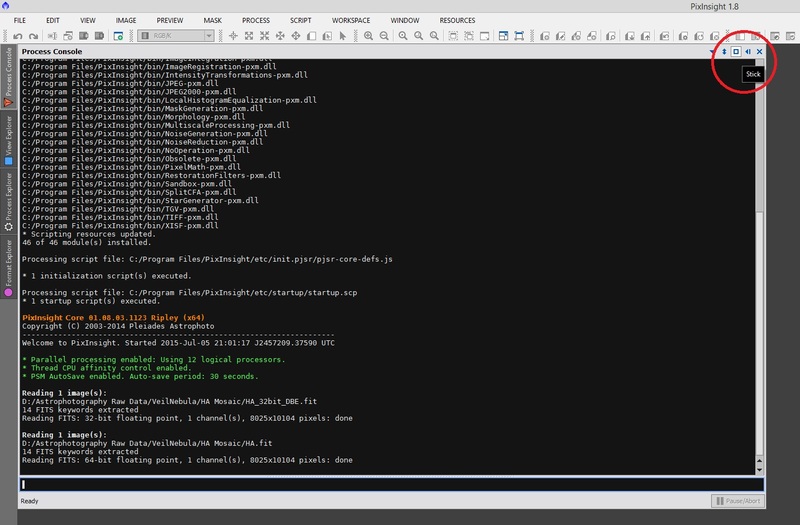 Contents of workspaces can also be quickly transferred between workspaces. 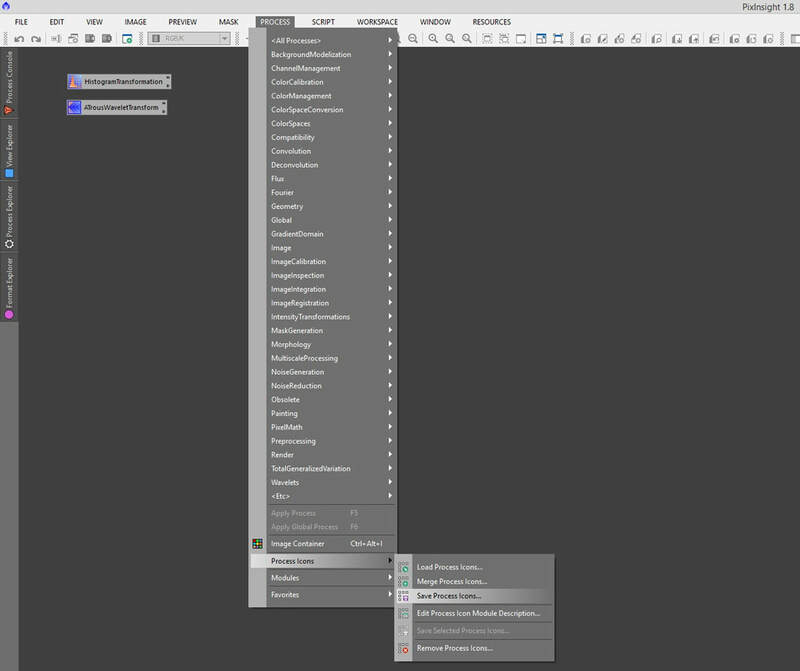 This is done through the menu Workspace -> Move Workspace Contents. Please note that this literally moves items, not copies. The move is carried out from the workspace you are currently in, to the one you select from the list of workspaces. Individual images, process windows and process icons can actually be transferred (moved) to another workspace from the workspace you are currently in by different means. 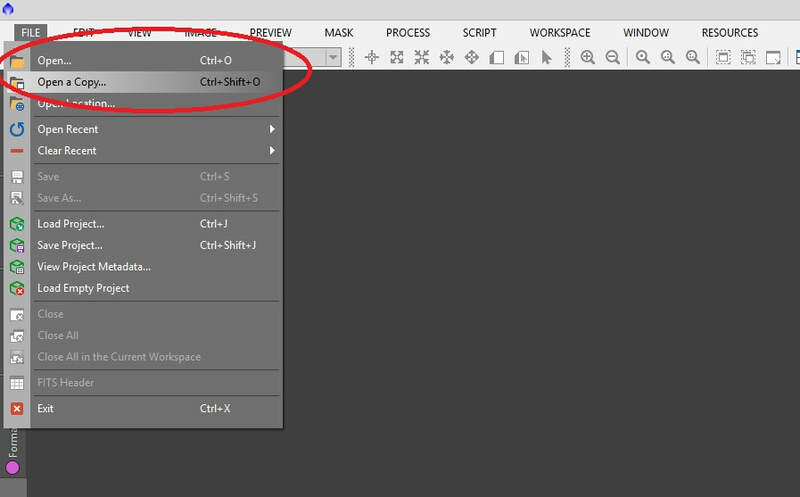 You can right-click on the title bar of the image window or process window and select the option To Workspace, followed by a workspace listed there. Selecting a workspace other than the one you are currently in will move the relevant image or process window there. ​This also works if the image or process window is minimised into an icon, as right-clicking the icon will pop up the same menu, though for minimised image windows this appears to then be called Move To Workspace as opposed to To Workspace (there is no difference in function!). 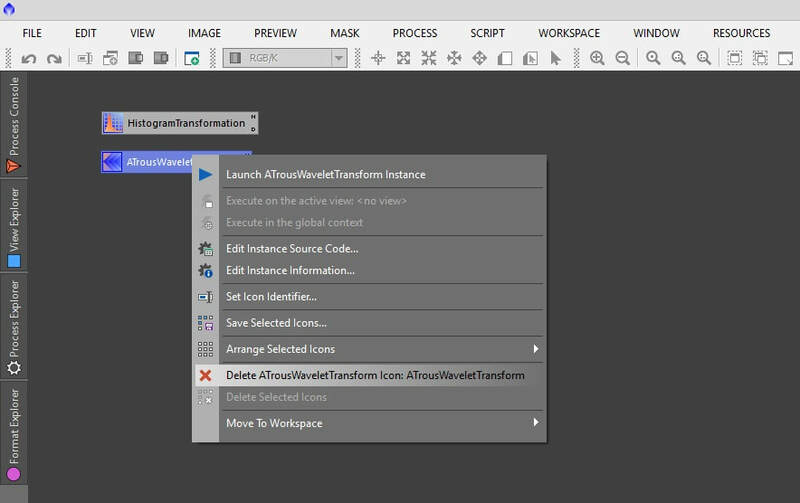 Process icons that are floating around your workspace can also be transferred (moved) in the same way. Please note that images stored in different workspaces are still accessible through every workspace. For example, you can have multiple mask images in one workspace and be working on your actual image in another workspace. 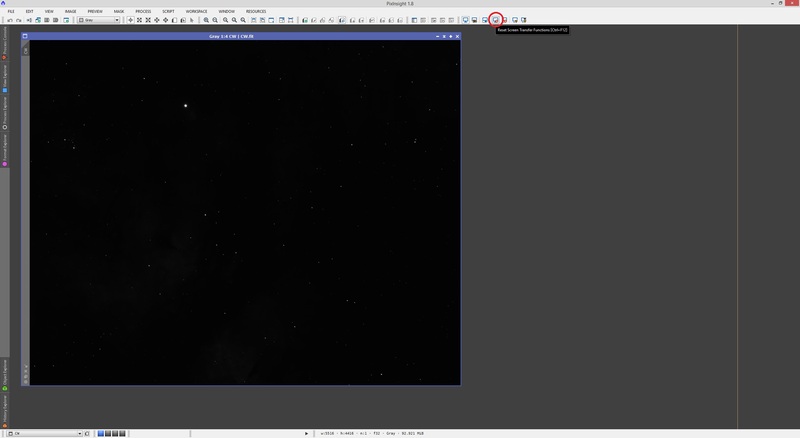 These mask images can still be selected from the workspace that contains the image you are working on, despite the mask images being on a different workspace. There is no difference in how to work with them - they will appear listed as compatible images all the same. Your uses for workspaces may vary. I personally very rarely use the facility as I simply keep images and processes I do not need immediately, minimised on the side. 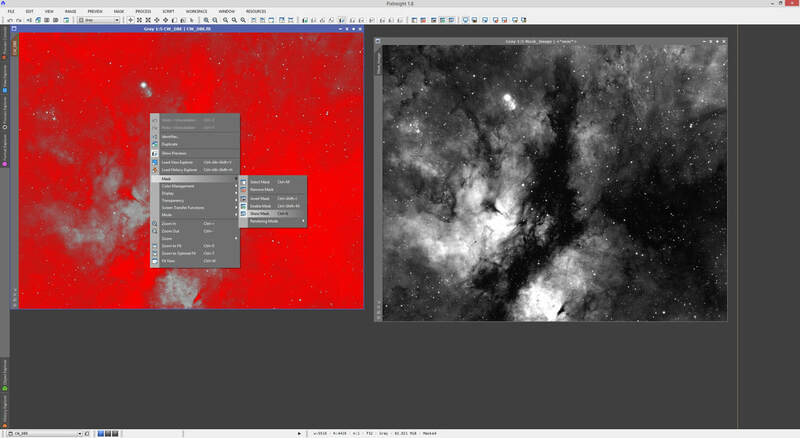 Much like in Adobe Photoshop, PixInsight can make use of masks to protect particular parts of an image. This part of the tutorial will not necessarily instruct in how to create particular masks, as this is the subject of another tutorial. However, this serves as an introduction to what masks do and how to work with them. A mask is an image that is overlaid on another image and is used to define what areas are protected from alterations and what areas are left unprotected so that alterations are applied there. For example, a mask could protect the background and stars but leave nebulosity unprotected. This means that an enhancement made to contrast would only be applied to the nebulosity, rather than the background or the stars. 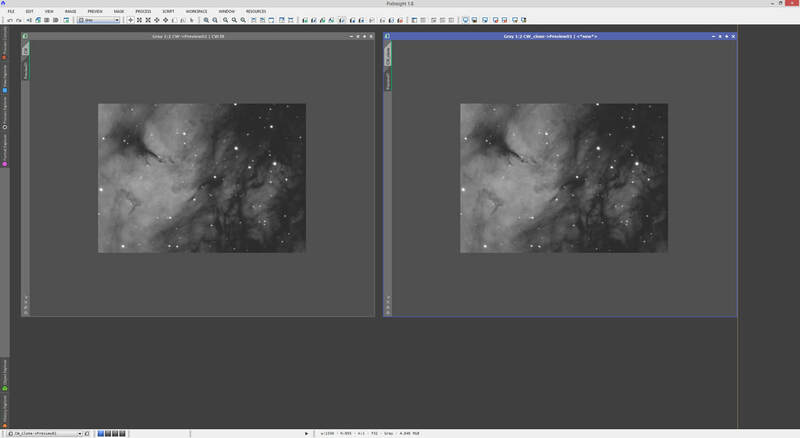 This ends up giving you a nicer result in the nebulosity without adversely affecting the background, which is usually dominated by noise. Masks can be created through a multitude of methods. A simple duplicate of an image can act as a mask, especially if it is monochrome. The duplicate can be stretched and white and black clipped with HistogramTransformation to further accentuate bright and dark areas, to maximise the mask's effectiveness. RangeSelection can be used to select out the brighter areas for creation of a mask image as well. Star masks can also be created using StarMask, to only protect stars for alterations. Images can be combined to produce a more suitable mask image, or bits can be painted out with CloneStamp to customise a mask image to your more specific needs. I remind you however that creation and customisation of the various types of mask is the subject of another tutorial, which covers this topic more in-depth. The above shows a monochrome image open and auto-stretched (it is still linear). Beside it is a stretched and white and black clipped duplicate image, which has been named Mask_Image as we will use it as a mask for the original image. Having stretched out the image to use as a mask gives a massively higher contrast to the bright areas in comparison to the dark areas. This means the mask image itself is more precise when it comes to protecting areas needing protecting. The white and black clipping has accentuated this even further. As it is, the mask can be made to protect the areas that are dark or the areas that are bright. This is chosen by either choosing to leave the mask as is or inverting it. Let us apply the mask image to our image. To do this, we simply click to select the image itself and then we right-click it and select the listed option Mask -> Select Mask. 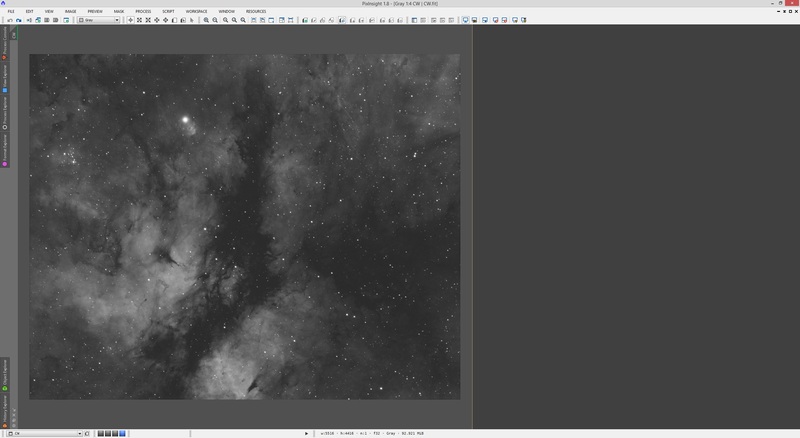 This is also accessible by selecting the image itself and then selecting the menu option Mask -> Select Mask at the top of PixInsight (rather than right-clicking the image). The corresponding keyboard shortcut is also usable for this purpose. Compatible images will be shown on the list for New Mask in the pop-up window. If your mask image does not match the dimensions of the image itself, it is deemed incompatible and it will not appear as an option. We select our Mask_Image can then click OK to apply it. Please note the Invert Mask option on the pop-up window. We need not bother with this as we can invert the mask while it is applied anyway. You will notice the image itself has gone very red indeed. The areas marked as red are being protected by the mask. Anything we do to the image will not be applied to areas covered in red, essentially. Since the mask image is not binarised (purely black or purely white) and is instead shades of grey (monochrome), the protection has varying degrees of application. The areas that are purely black are completely protected but areas that are very dark grey are mostly protected while areas that are purely white are completely unprotected (naturally, areas that are bright but not white are mostly unprotected). Of course, the mask image is not letting us see what we actually do to the image itself. To help with this, PixInsight allows us to hide a mask without disabling it. This gives your image its original look (rather than being plastered in red areas) but retains the mask's protection. To do this, simply right-click on the image and select the option Mask -> Show Mask. 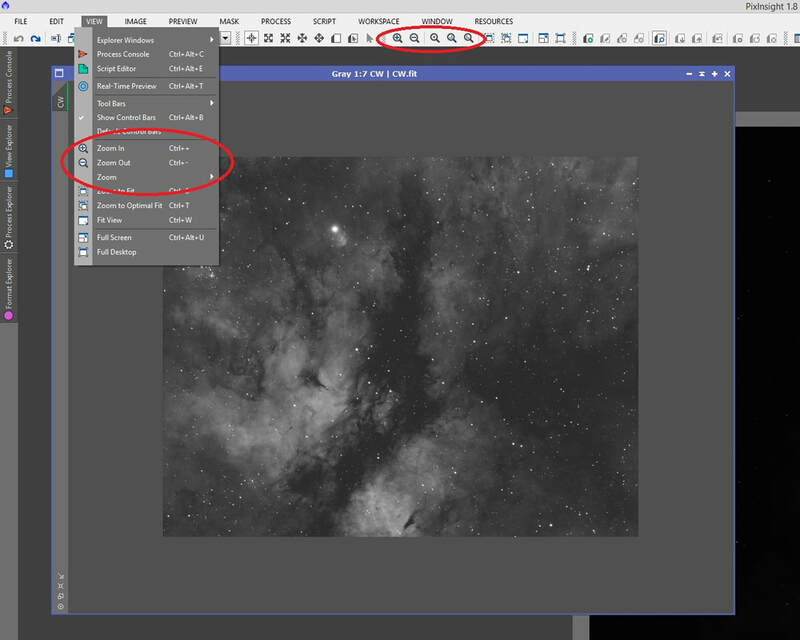 This is also accessible through PixInsight's Mask -> Show Mask menu option, or its corresponding keyboard shortcut. 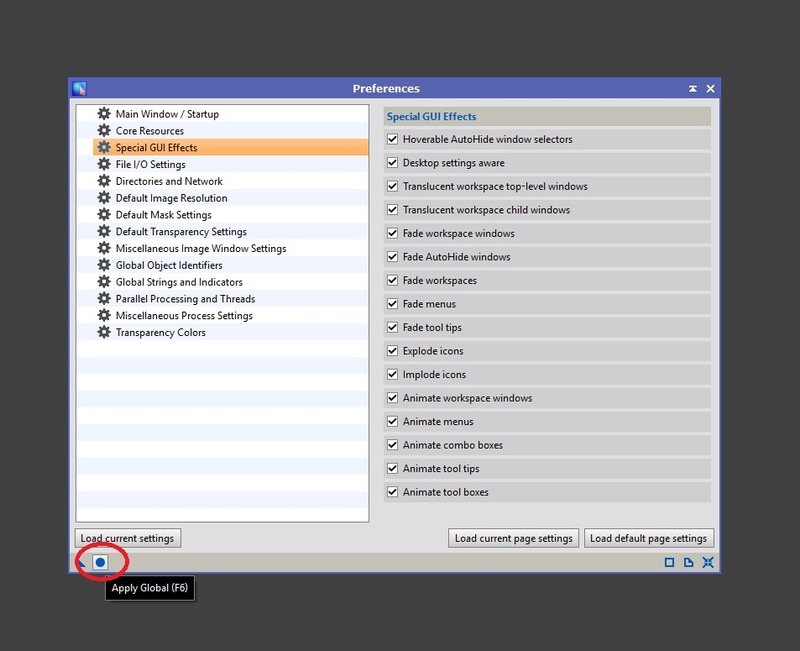 The option for Enable Mask shown above is not the one to use if you are trying to hide the mask as selecting Enable Mask will disable it and thus remove its protection. It will still be applied to the image, but it will not function until Enable Mask is selected again. Please remember to use the Show Mask option to hide the mask. From this same menu, we see we can invert the mask by selecting Invert Mask. Its corresponding keyboard shortcut also works. We now show the mask to see the difference inverting it makes. Dark areas are now unprotected while bright areas are protected. This would in theory allow us to attack the background, perhaps by reducing its contrast to make it darker and more neutral without spoiling the image with hard edges. The original mask's application of leaving bright areas unprotected is ideal to attack the nebulosity, perhaps to enhance its contrast without touching the background. Mask images can be combined, of course. For instance, we can create a mask as above but then create a star mask (purely containing stars) and subtract the star mask from our mask image. This gives us a resulting mask image that allows us to attack bright nebulosity without attacking the stars as well. This is very useful for some processes as some processes can cause ringing around stars (introduce slightly dark halos around stars and in severe cases, burn out the cores of stars with a dark spot in the centre). As aforementioned, the specifics of mask creation are the subject for another tutorial. If you wish to alter the colour that is used to display which areas of the image are being protected by the mask, you can change this quickly to a selection of colours provided by PixInsight. Simply right-click the image being protected by the mask and look at the menu Mask -> Rendering Mode. A selection of colours is provided. 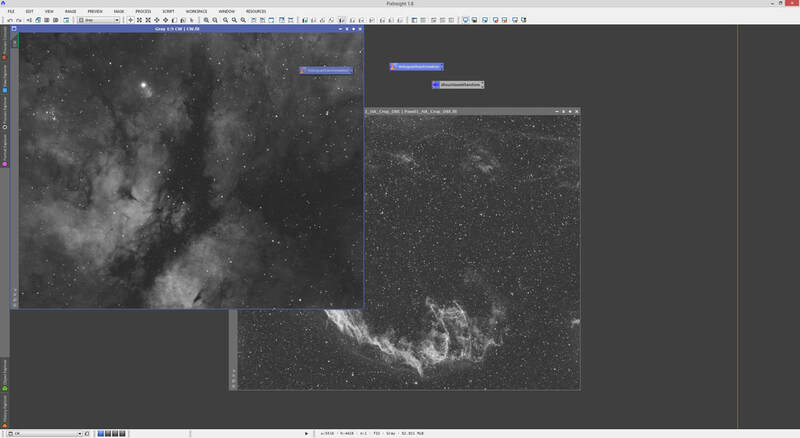 Naturally, this is also accessible through the PixInsight menu Mask -> Rendering Mode. There are no keyboard shortcuts for this function, however. Use of a different colour can aid in seeing what it is the mask is protecting, depending on the image being post-processed, the eyes of the user, the monitor being used, etc. You may not use this function at all, but it is there in case you wish to make use of it. Once you are done with a mask, it can be removed more easily than it was applied. To do this, right-click on the image with the mask and select the option Mask -> Remove Mask. This can also be done through the PixInsight menu option Mask -> Remove Mask. There is no keyboard shortcut for this function. Generally speaking, if the mask image is no longer going to be used, it can be closed without saving it as it was only a temporary tool to allow careful enhancement of your actual image. 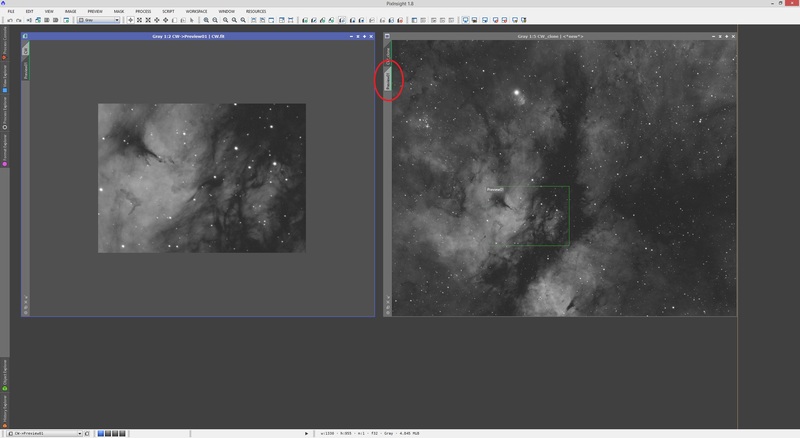 If you close without saving the mask image without first removing it as a mask, PixInsight will warn of this and if you confirm, it will automatically remove the mask. If you have multiple mask images to use on one image, you can select one, carry out your enhancements and then apply a new one without removing the current one first, via the same process used to apply the first mask image. Projects in PixInsight can be incredibly useful if used often. They basically save the entire working state of PixInsight. This includes your open images, your process settings, your process icons and your workspaces. It also saves one very important aspect of your images - their processing history. This means you can load the project later on and still Undo and Redo as if you just applied those processes or scripts. 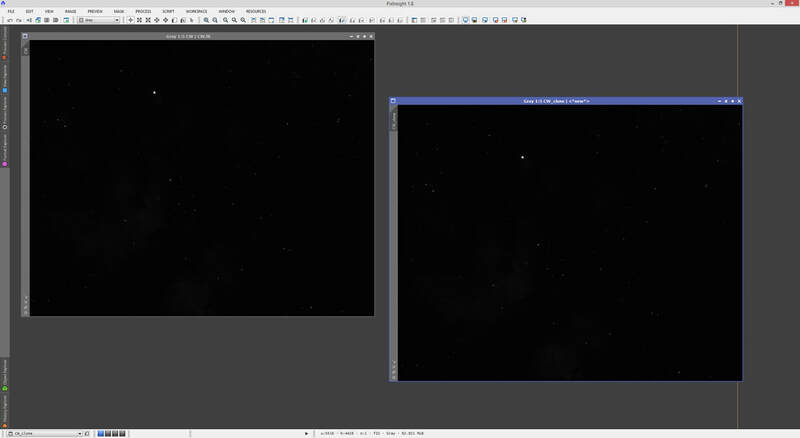 This is one major benefit of using projects in PixInsight. A project can be created for an image you are working on and it can be loaded up at any time in the future. When you start PixInsight, it will automatically be blank - containing nothing but default settings for processes and no open images or process icons. These can be loaded, of course, but generally this is the start of your empty project. 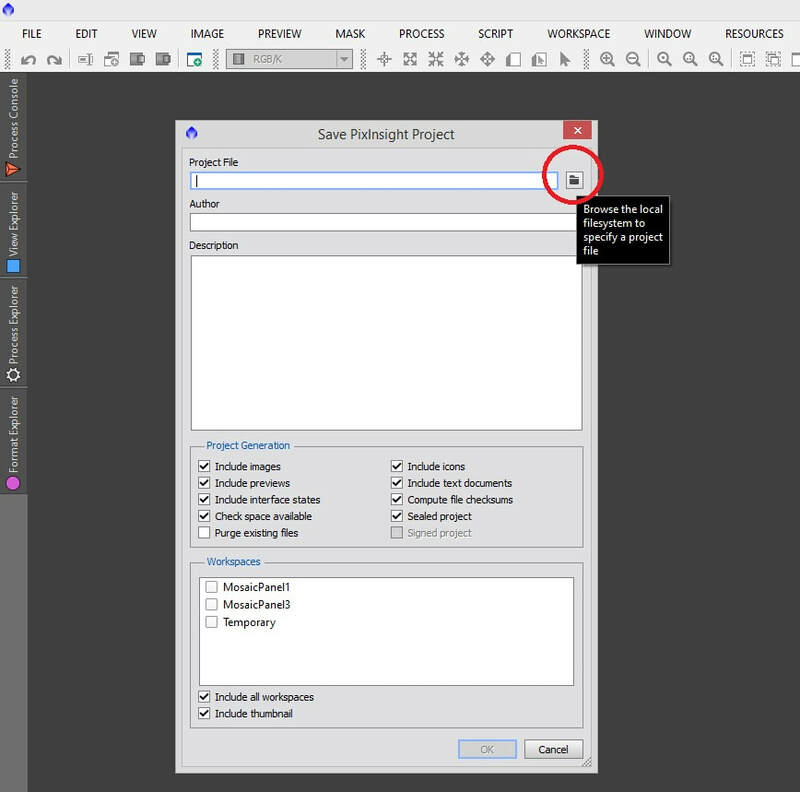 If at any point you wish to carry this out without closing and re-opening PixInsight, simply select the menu option File -> Load Empty Project. At this point, you may wish to load process icons if you have a setup saved that you usually use. You can also proceed to set up your workspaces, load your images and generally begin pre- or post-processing your images. At some early stage, after having set up your project, you may wish to save it to create it for the first time. 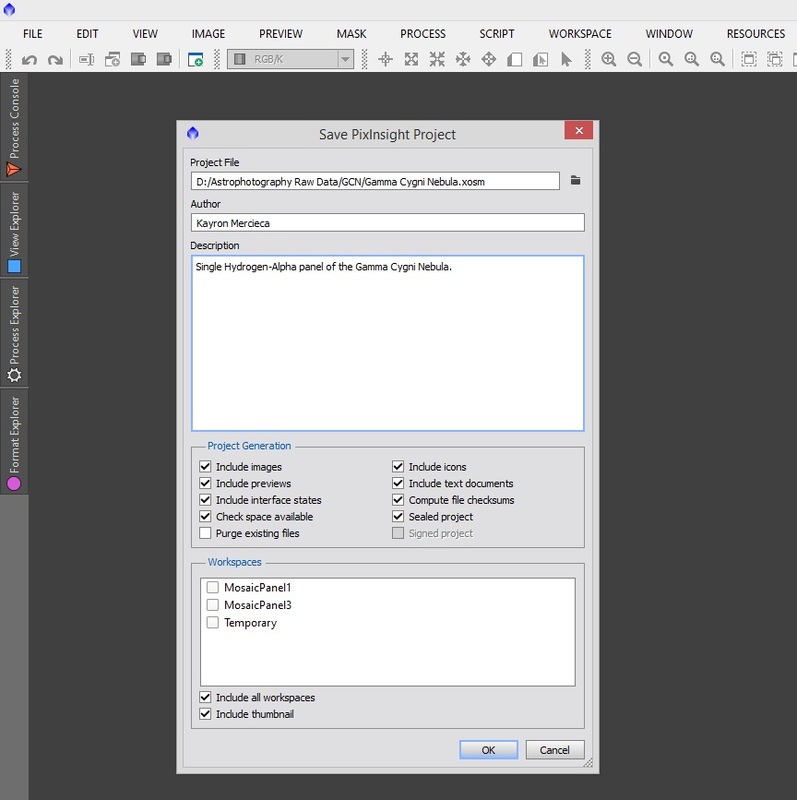 This is simply done through the File -> Save Project menu option. ​By default, under Project Generation, everything is selected, except Purge existing files. You may select to enable this option if you want the project to be completely replaced if this is not your first save of the project's progress. It is probably a good idea to leave everything enabled unless you have a good reason not to save a particular aspect of your project. 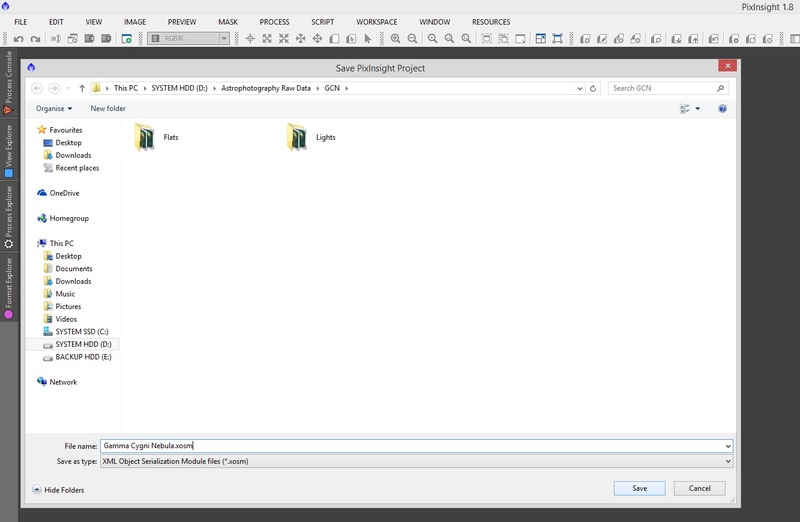 For the first time you save a project, click the folder icon button on the right of Project File to seleect a folder to save your project in and give it a name. Under Author, you may naturally want to enter your own name. In Description, you may enter whatever you wish. This could be a description of what the image project entails - a 4-panel mosaic of the Gamma Cygni Nebula perhaps? Author and Description are entirely optional fields and you need not enter anything if you do not wish to. This will create the project files on your chosen folder. The folder itself contains the project data such as open images, image processing history, process icons, process settings, workspaces, etc. The file with the XOSM file extension is the main project file that you will be loading in the future. 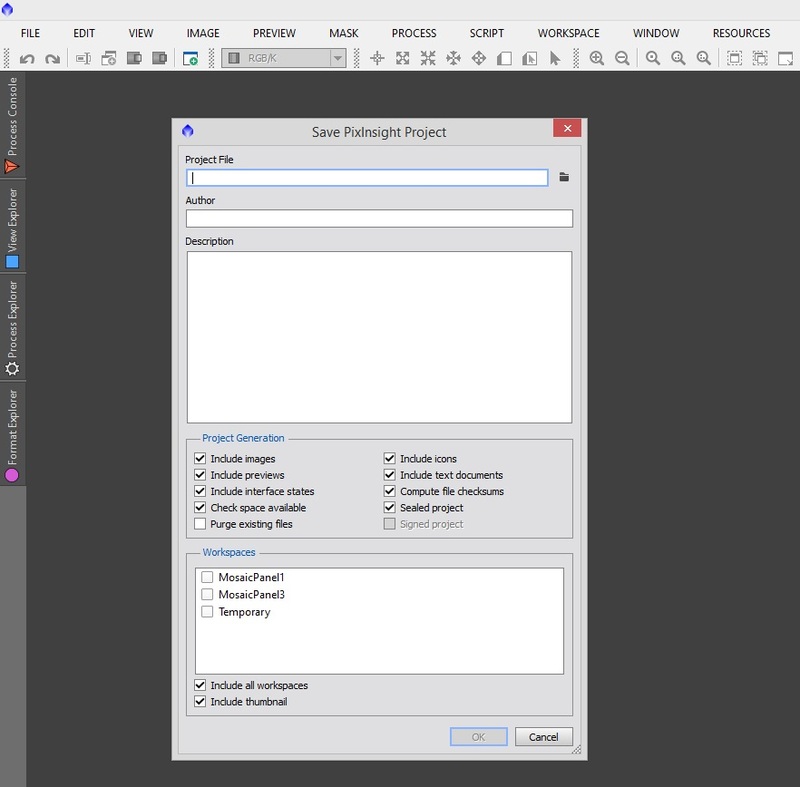 If you make some changes to your project and want to save changes, you can simply access the same menu option File -> Save Project. This will pop-up the same save window, but with the details already filled in. ​You may change anything you wish here but simply clicking OK will save the changes made, though it will ask if you wish to overwrite. You must answer Yes if this is to save changes. In the future, you can load the project via the menu option File -> Load Project. 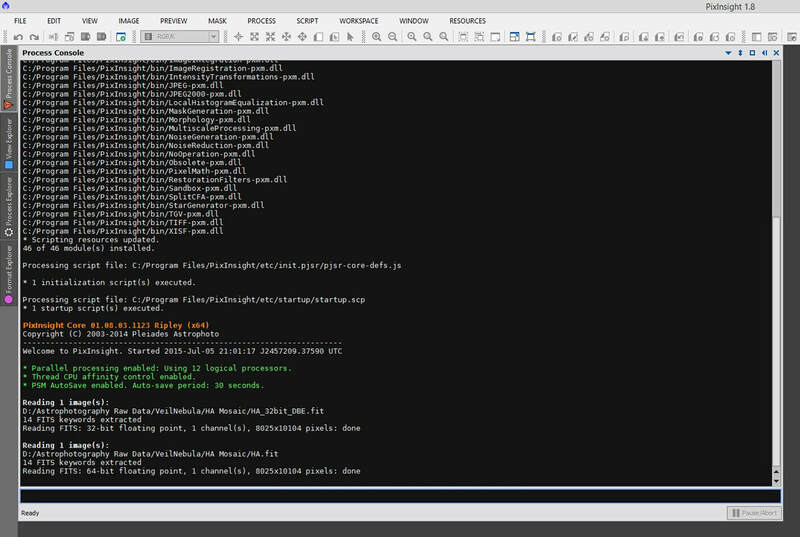 Here you can browse your computer to find your project's XOSM file and just double-click it to open the project. Everything will load and will be as when you last saved the project, with everything in the position you left them in within the workspaces. 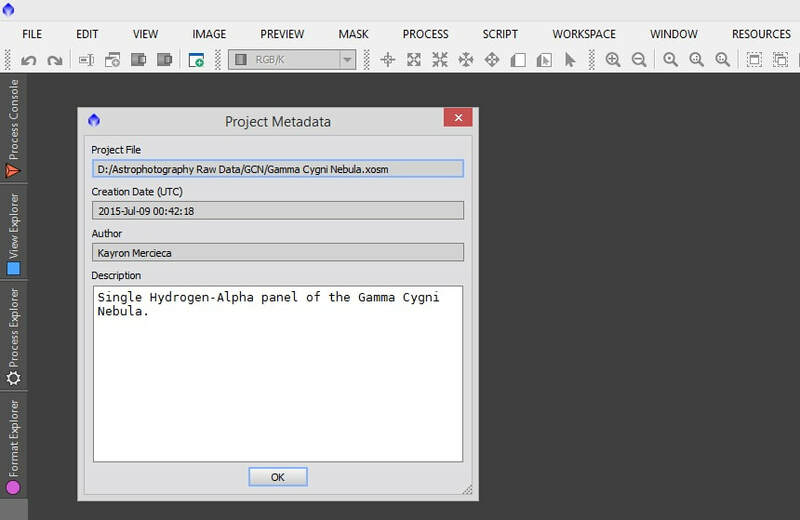 At any time while a project is open, you may view its entered Author and Description data (the project's metadata) by selecting the menu option File -> View Project Metadata. This concludes the section on PixInsight projects. Keep them in mind in terms of how useful it can be to be able to flick through an image's processing history and to store process settings and process icons used in a particular image's post-processing. Projects can prevent a lot of frustration.